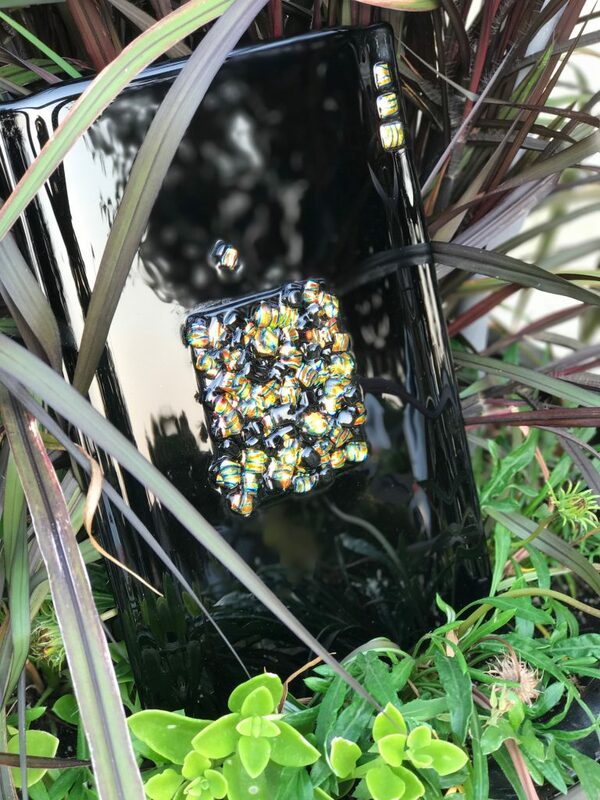 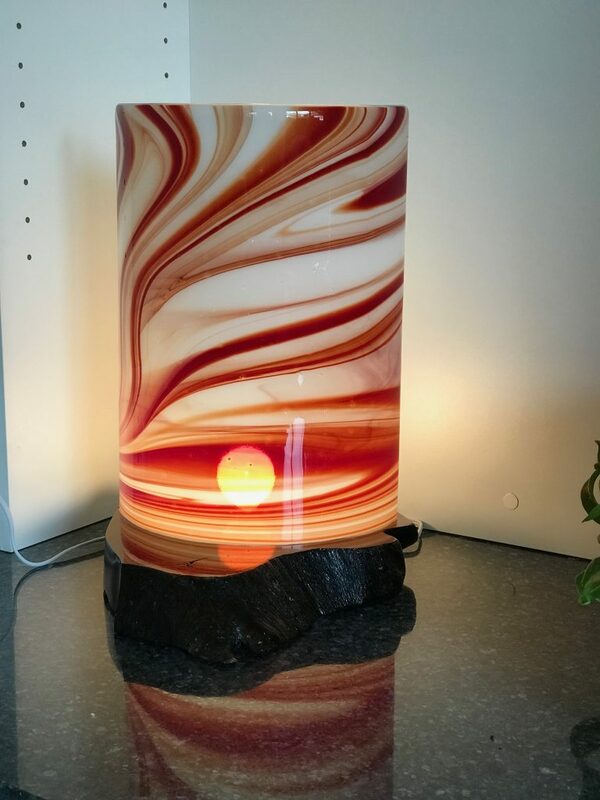 The Fusion Glass Lamp I made for home and my husband loves this piece so much that it is now a permanent fixure in my home. 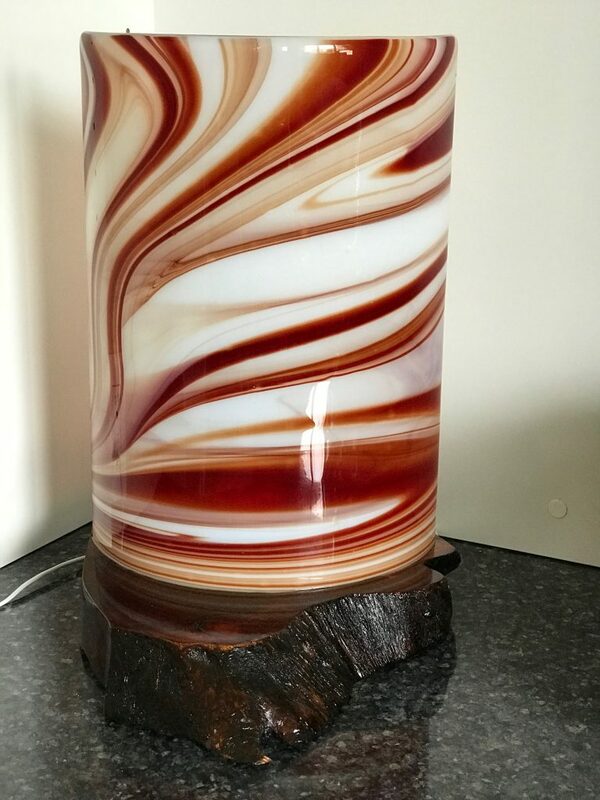 If you love this piece let me know the colours you would like and I will make one for you also. 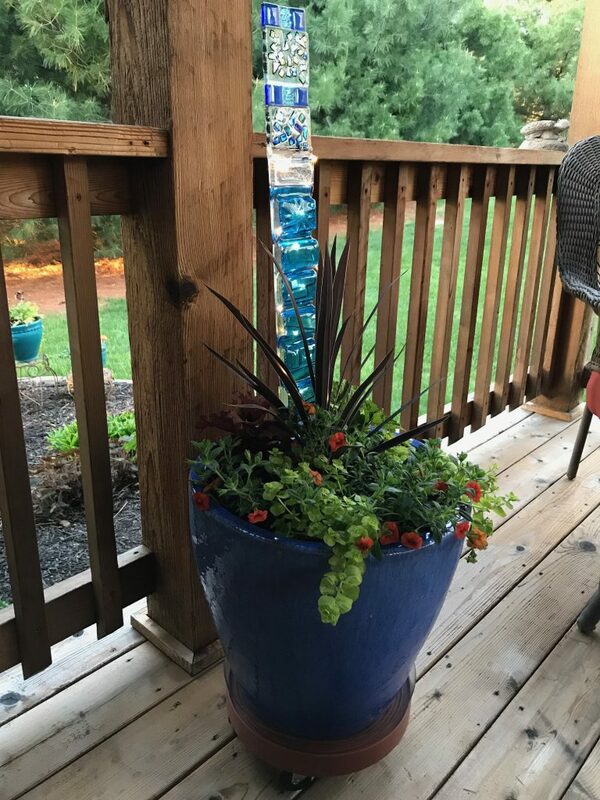 A Beautiful lady purchased this Garden Stake from me and I have to say I was pleased. 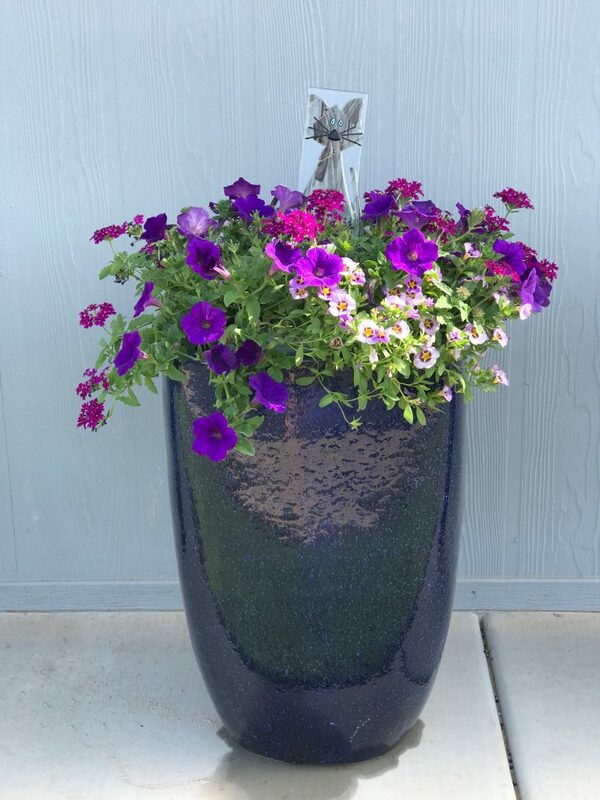 She always has a beautiful place with her outdoor decorating as you can see how she displays the Garden Stake in her container. 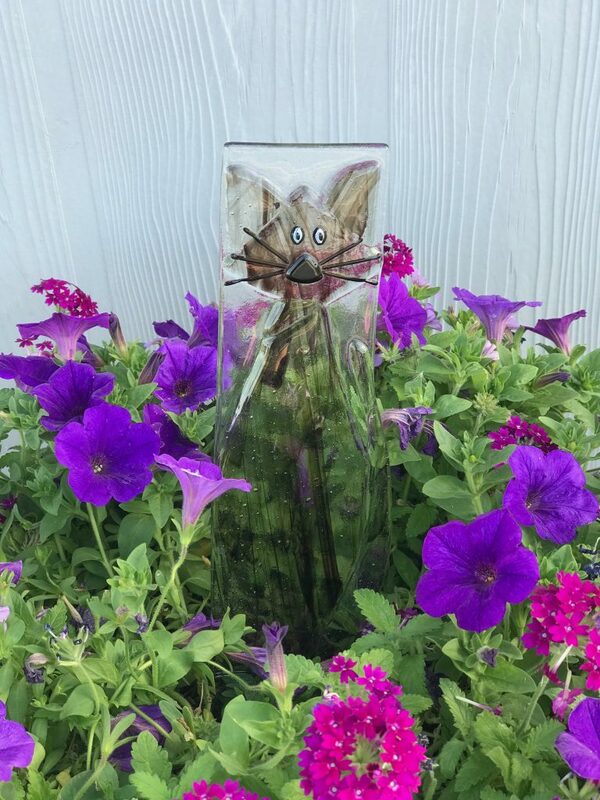 Its hard to see in this picture but she has wound some little lights through the Garden Stake – Beautiful Thank You for the Picture and for purchasing the Garden Stake!!! 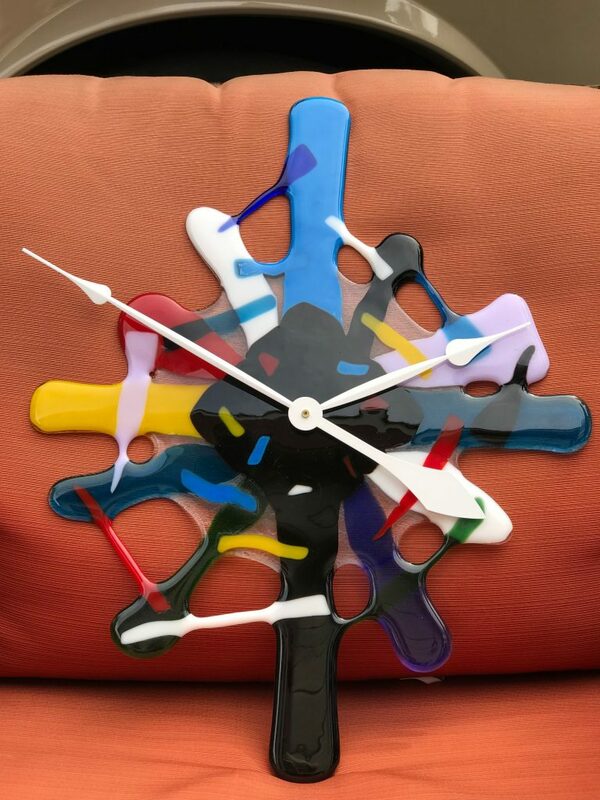 I call this Clock the June Clock as she is the person I made it specially for. 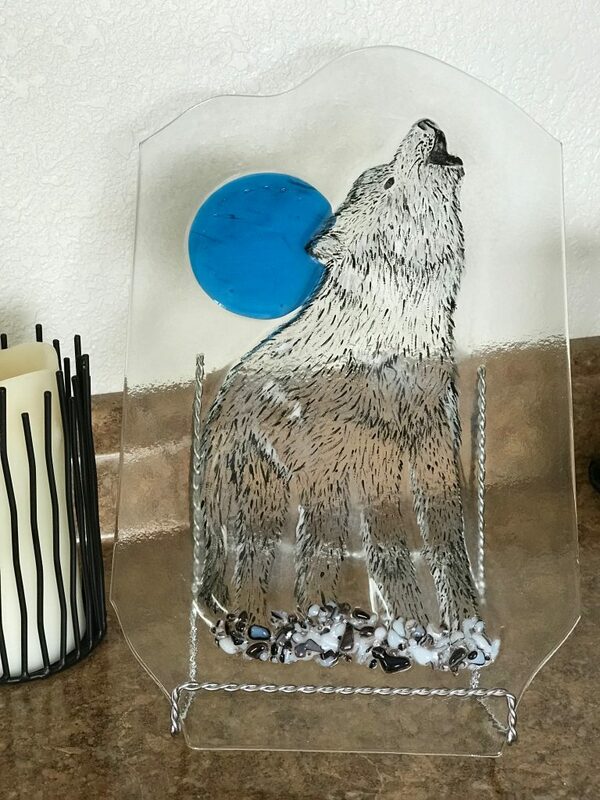 The Wolf was made for a very special Couple!! 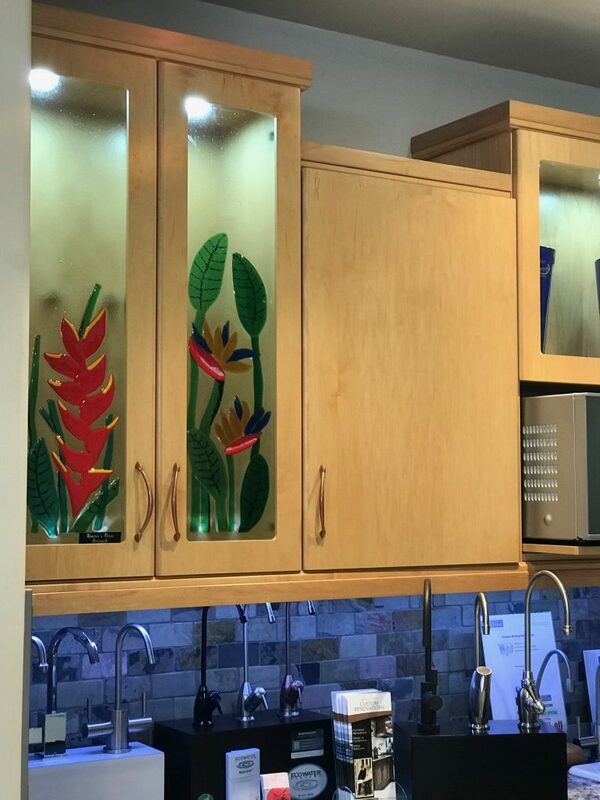 I hope you love it as much as I love it. 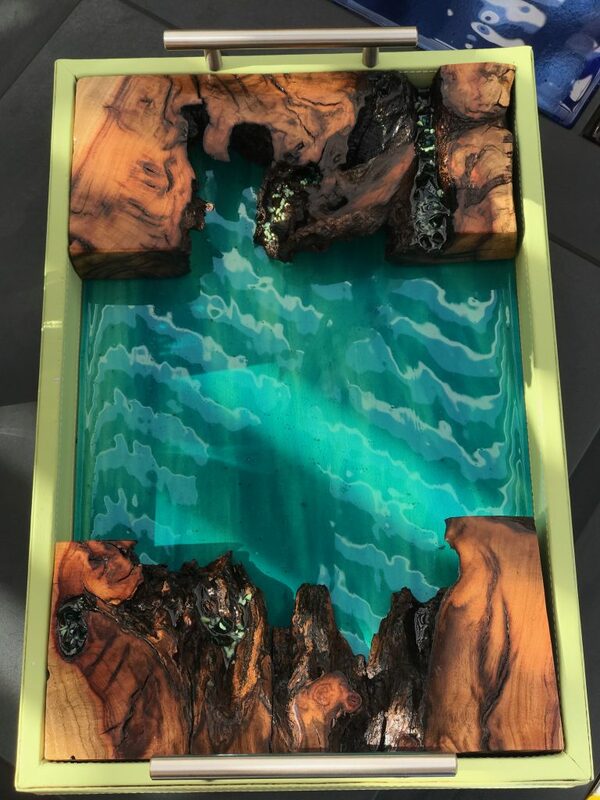 A very good friend of mine actually did a beautiful wave and was asked to do another one to sell, she passed the custom work onto me to do. 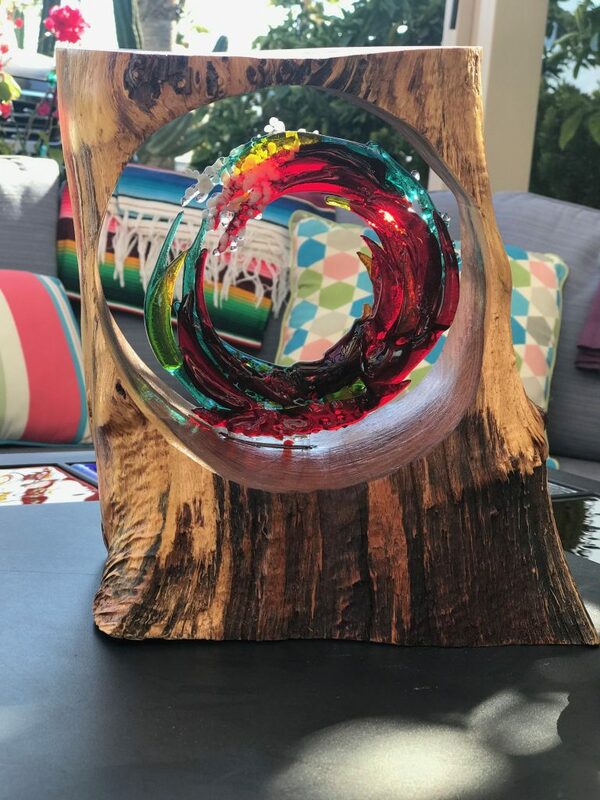 So here it is – you can have your own Custom Wave made – please look at Home Decor for the price. 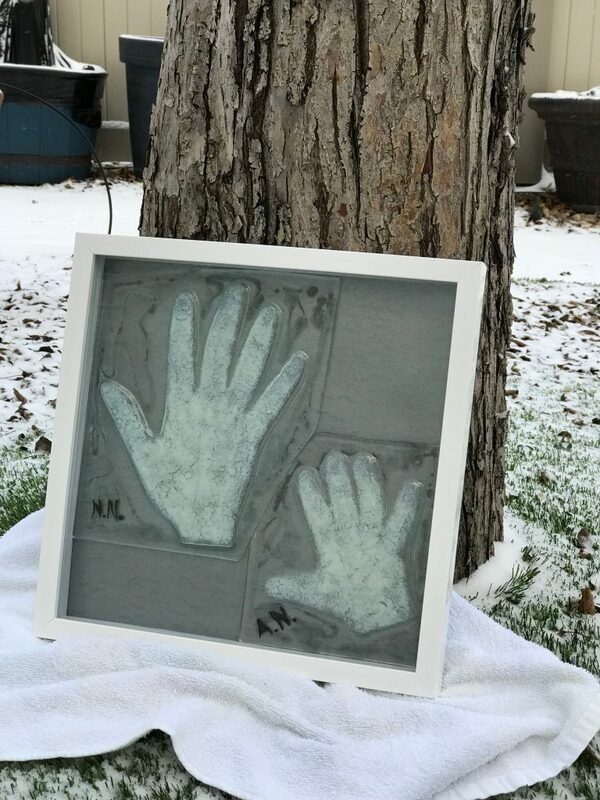 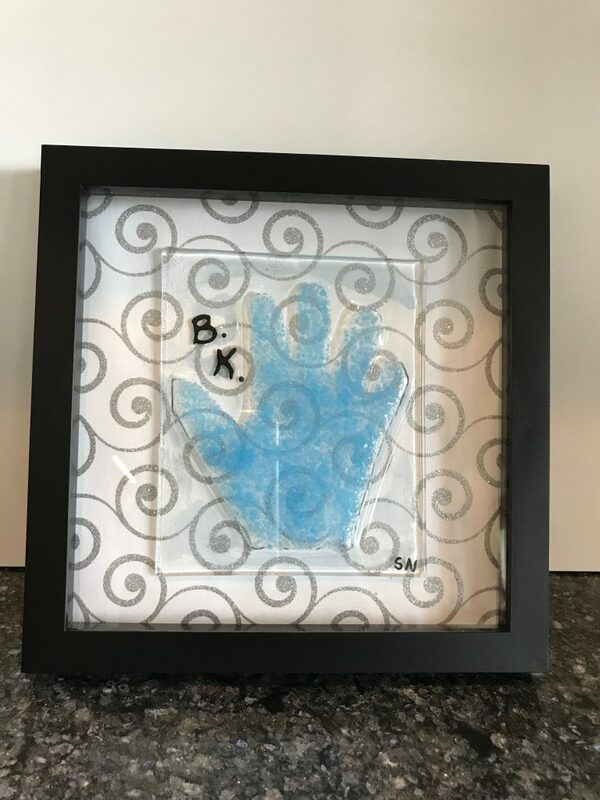 What better way to make your memories keep forever – Looking at your Hand Print’s of your own family are so special – especially when you have little ones – you will always be able to remember how small they are/were forever. 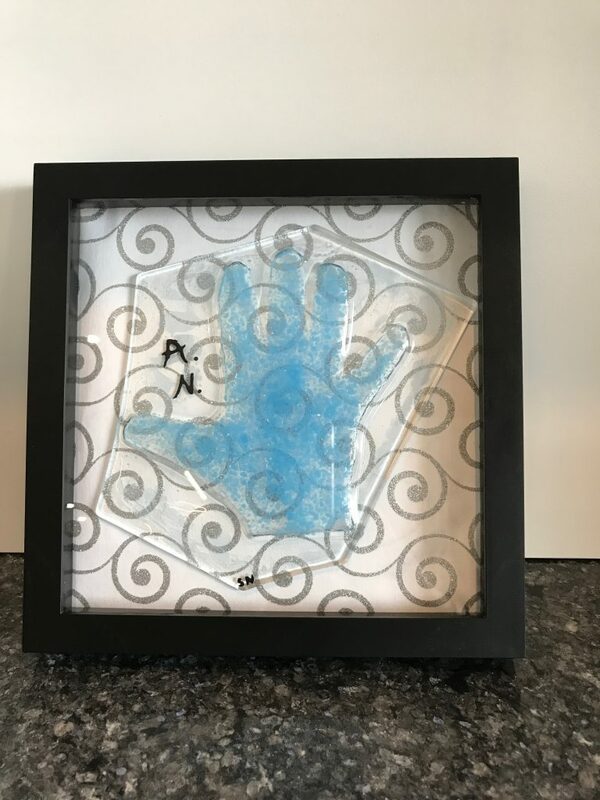 With the Family Hand Prints you can have them in different colours and different backgrounds – the pictures really don’t show you that each Hand Print is raised up. 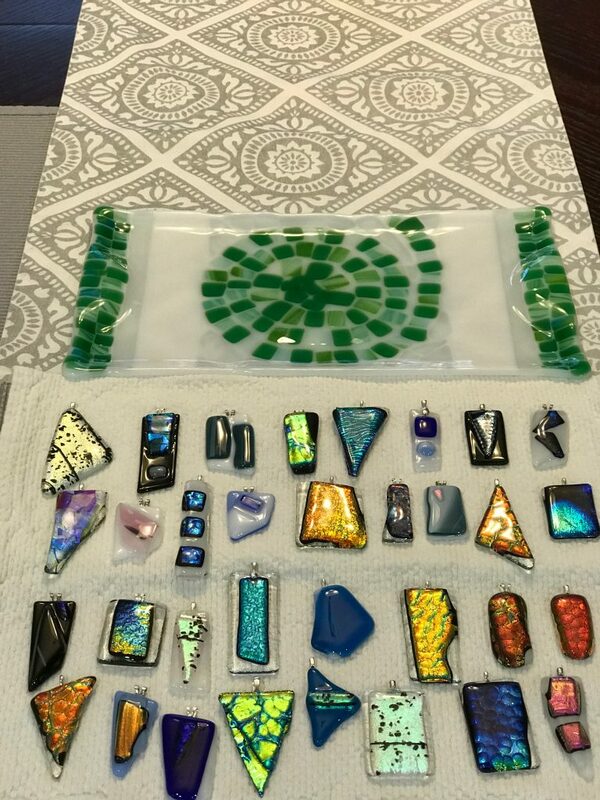 I hope you love these as much as I do!! 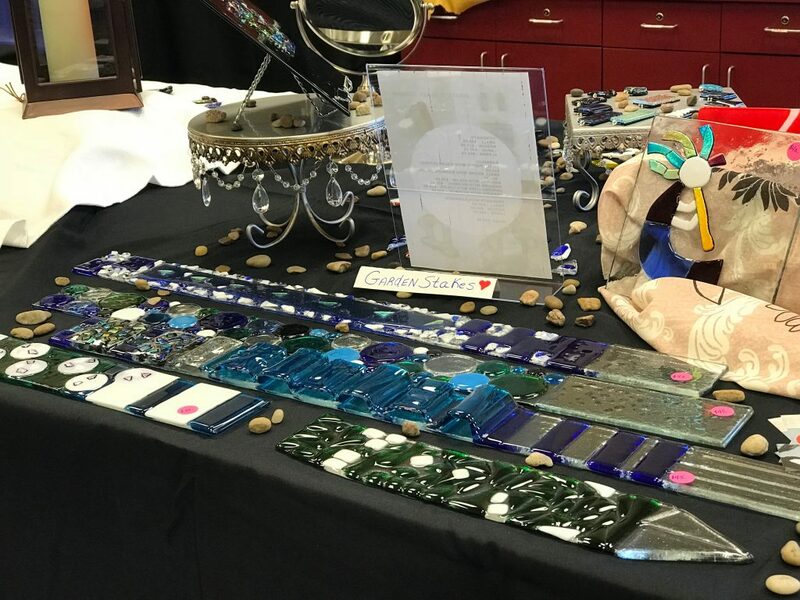 My Daughter Jen from A Beautiful Inspiration had a Bloggers & Cocktails Event on October 26 s0 I made the Pendants below for each of the guests and donated the Appetizer Plate as a door prize! 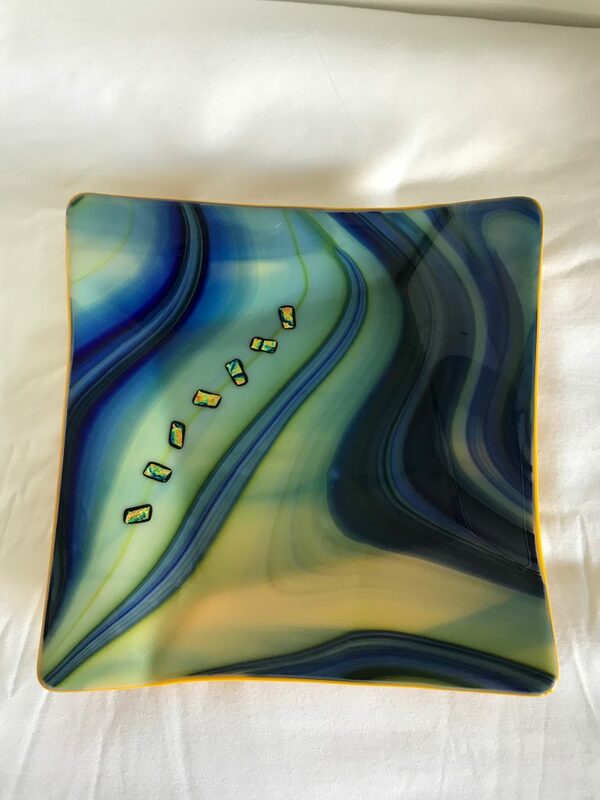 This square wavy dish was actually my first piece I did and I one the of reasons I fell in love with fusion glass. 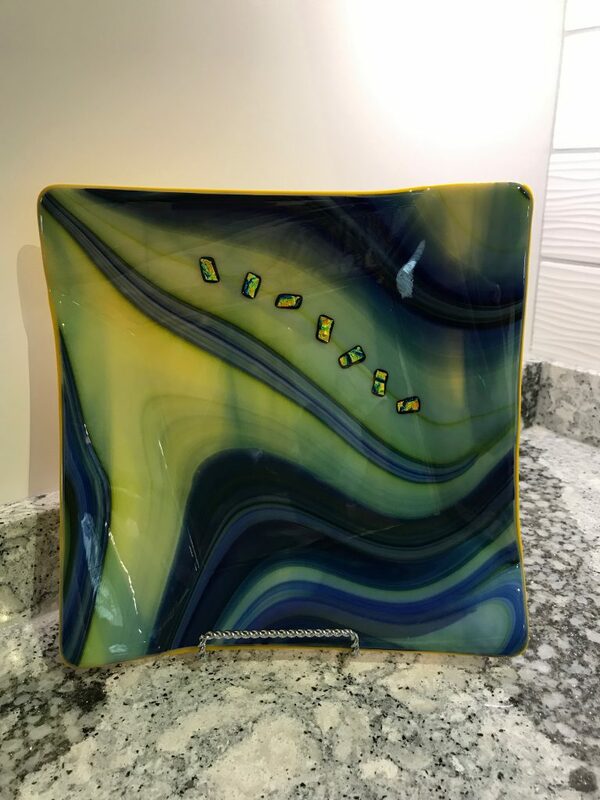 This dish has a yellow back which really made the swirls show up – I added some dichroic just to give it a different look. 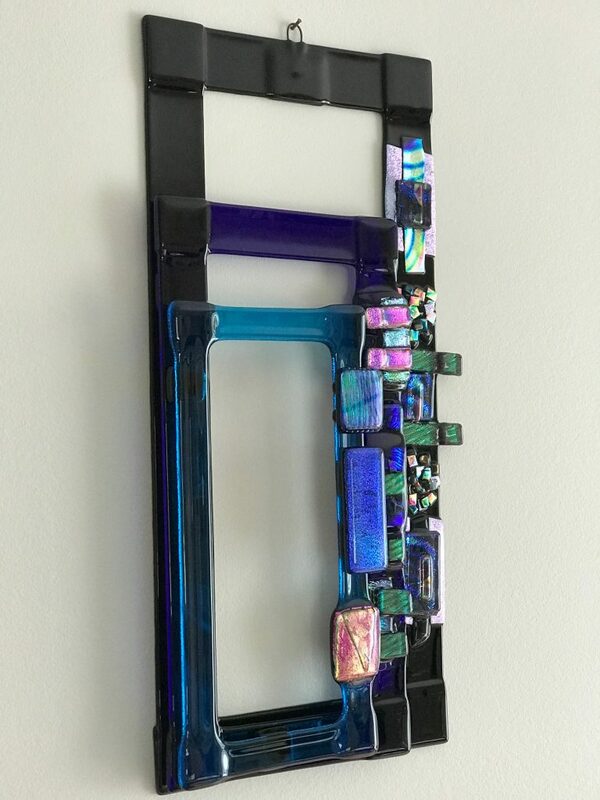 I have to say every time I look at this piece I think of how beautiful it is. 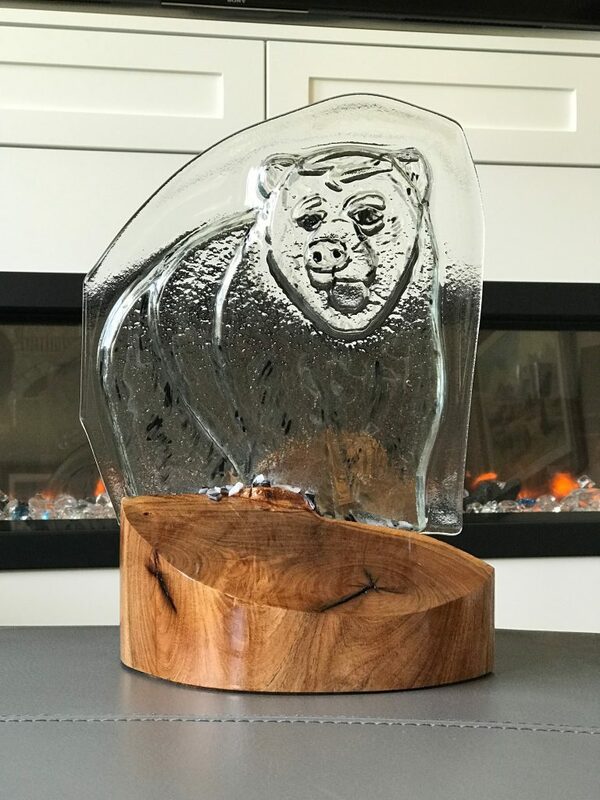 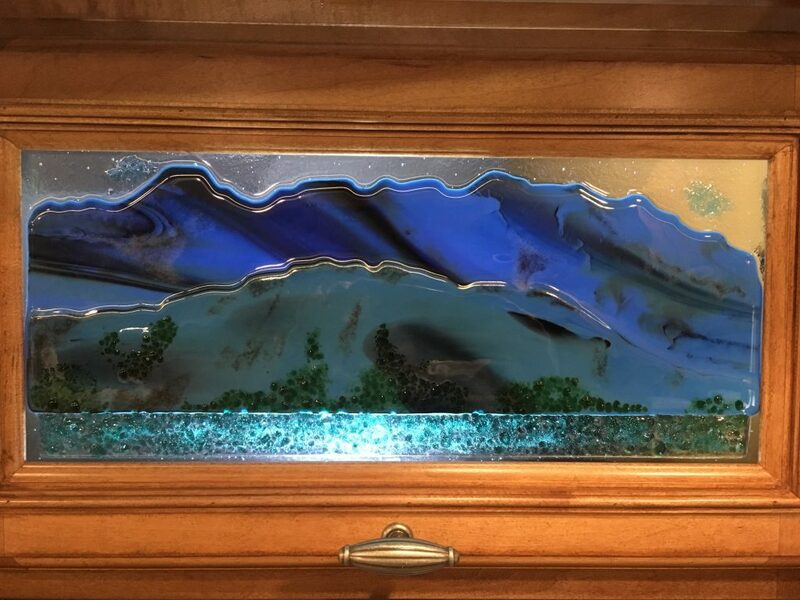 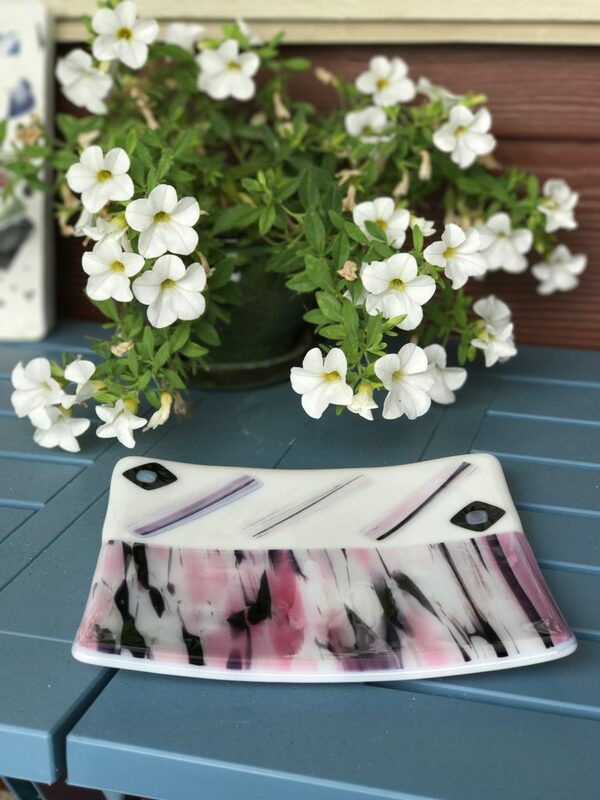 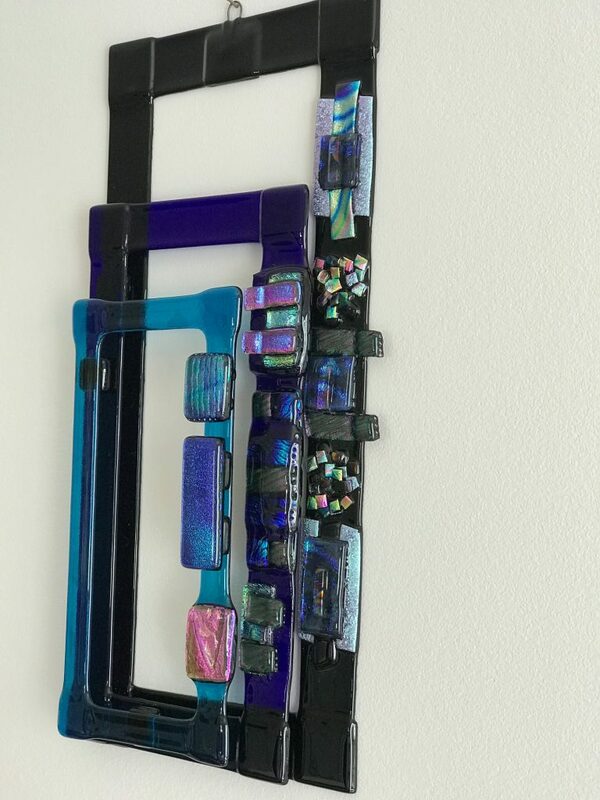 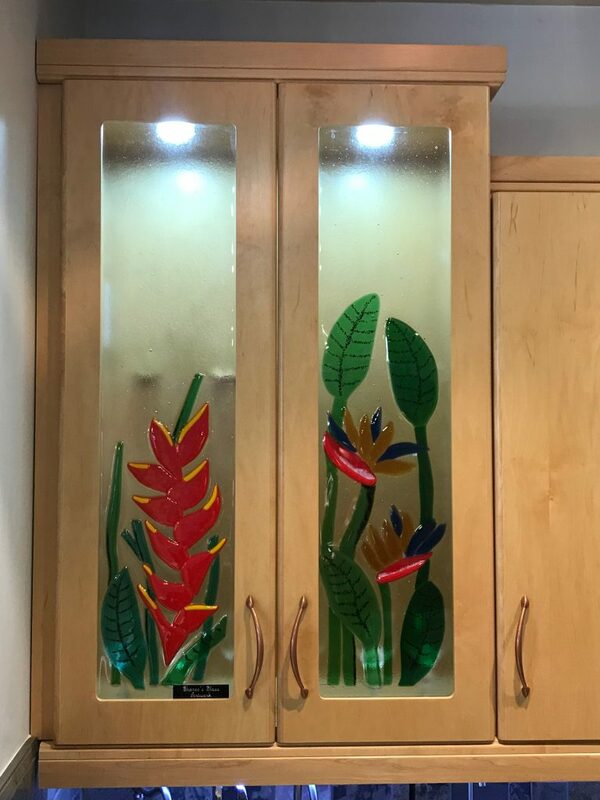 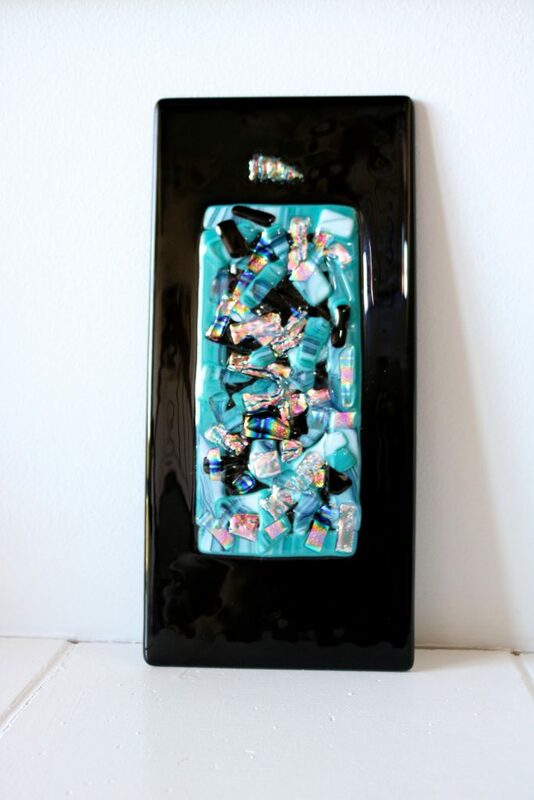 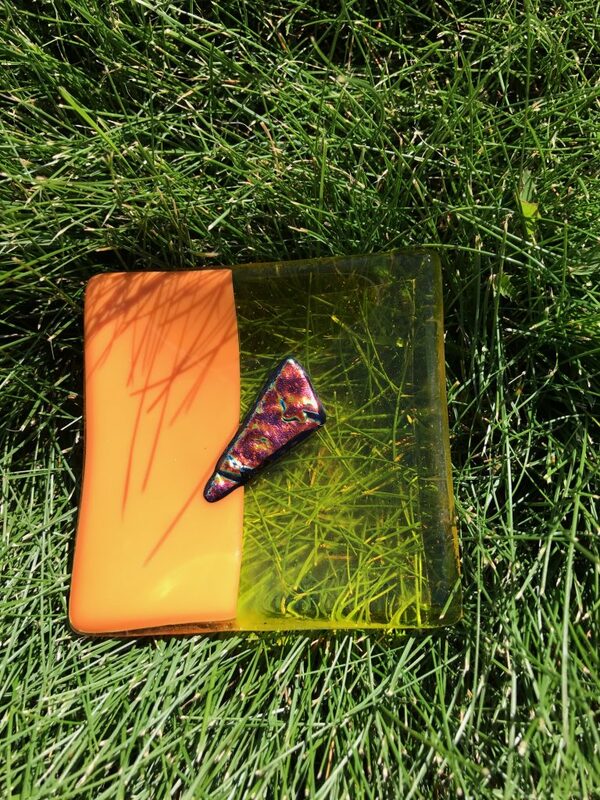 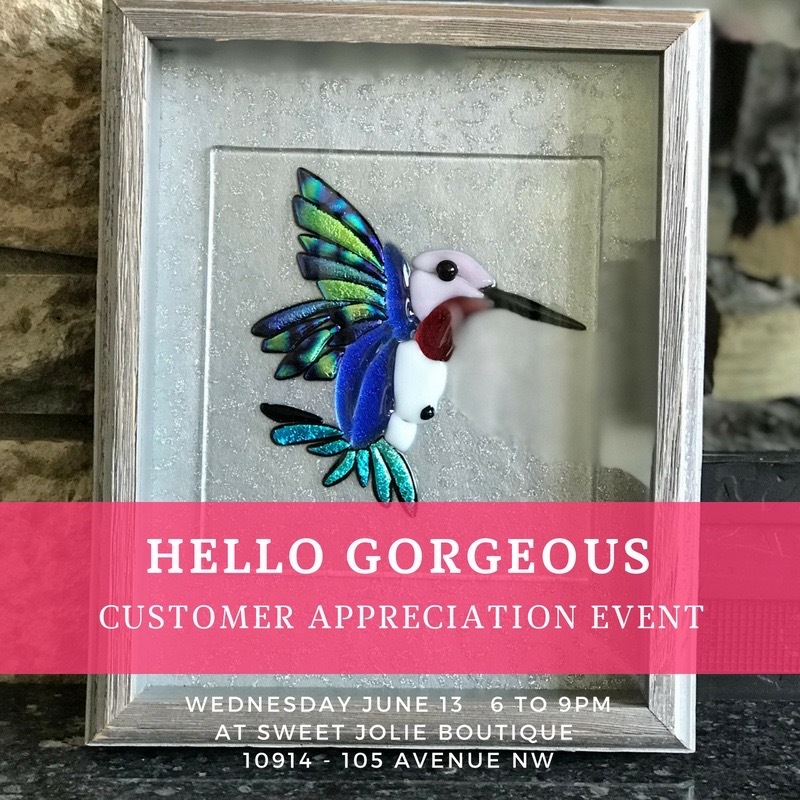 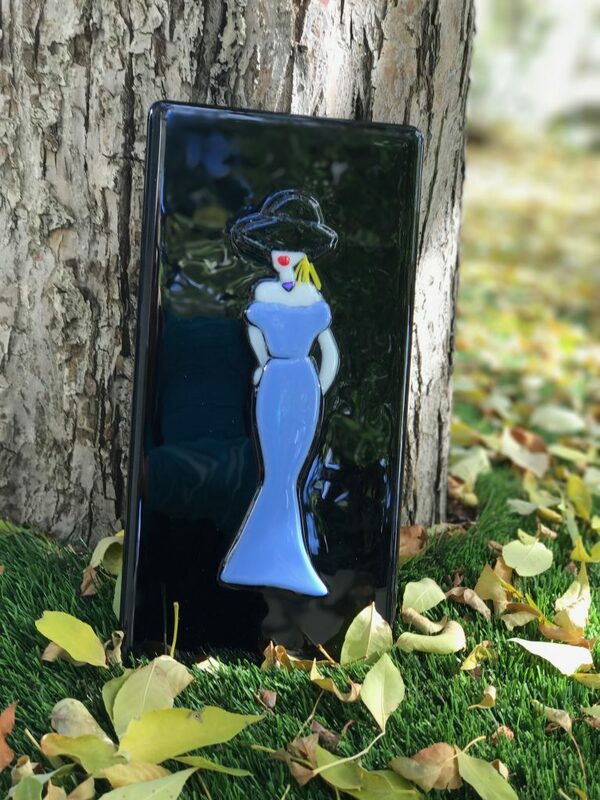 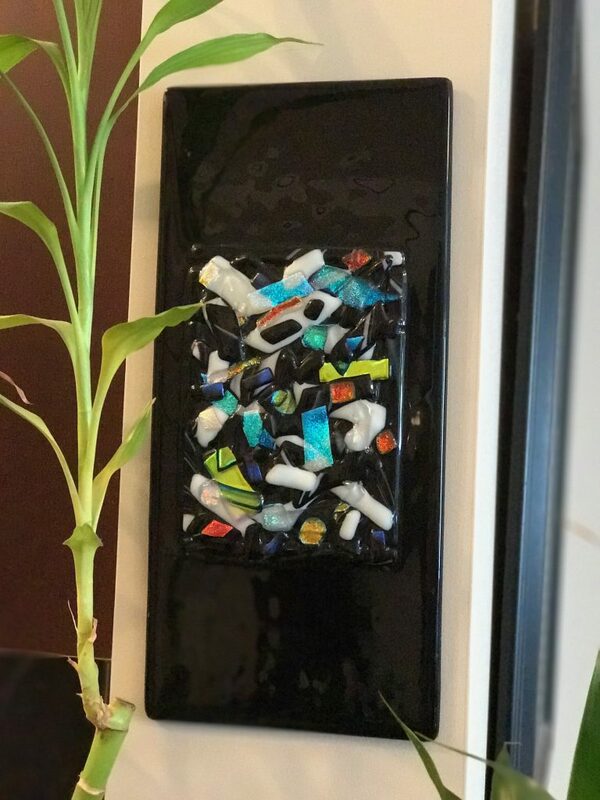 When working with this Glass every piece will be a little bit different, and that is the beauty of it as it is totally one of a kind piece of art. 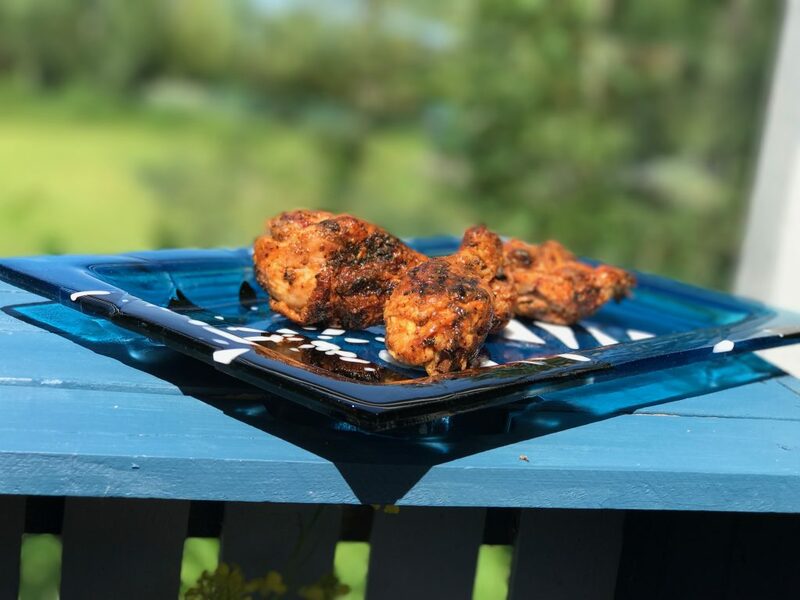 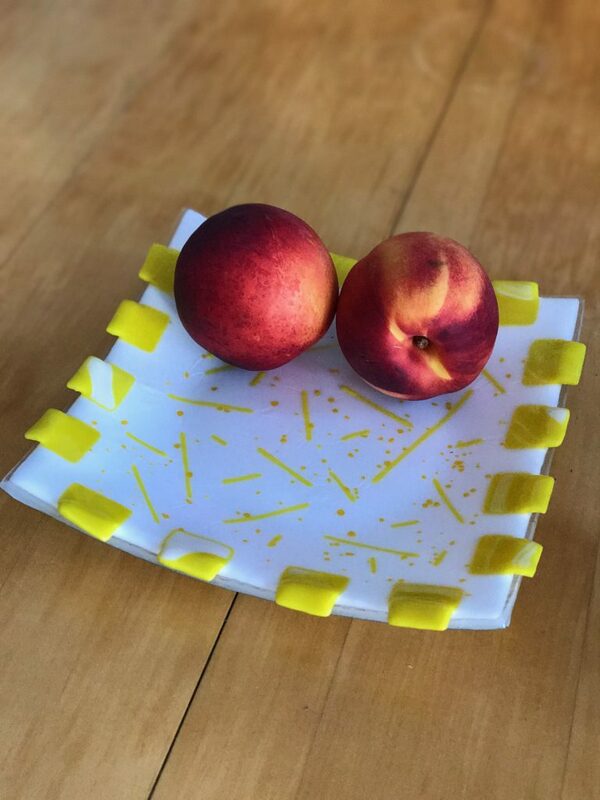 The Serving Platter below was actually make accidentally and I learned a lot from it. 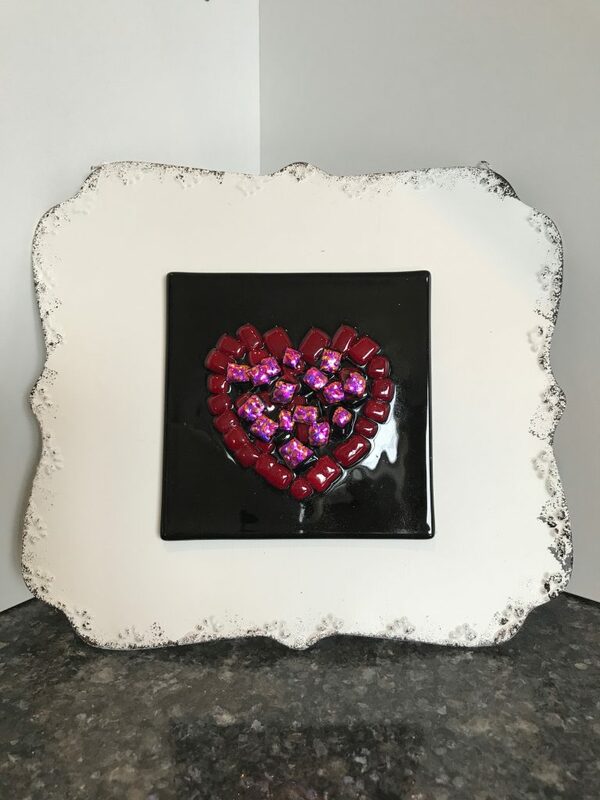 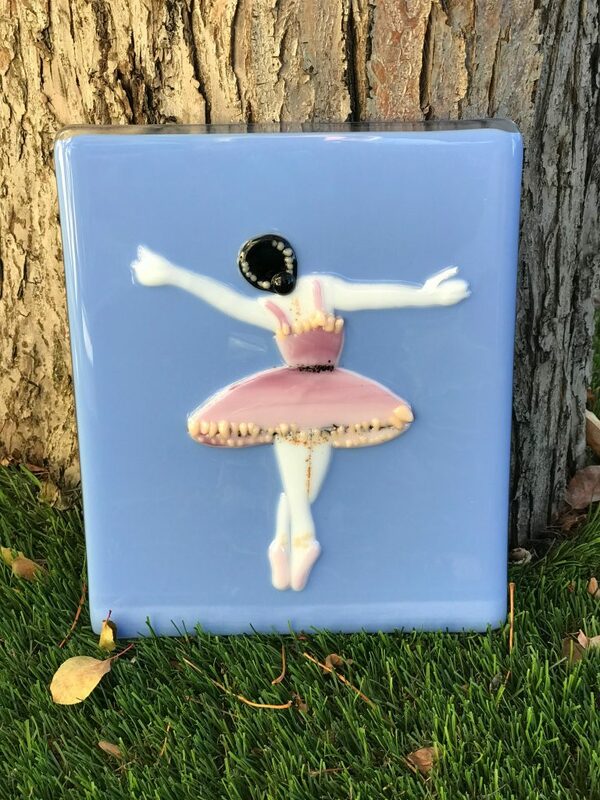 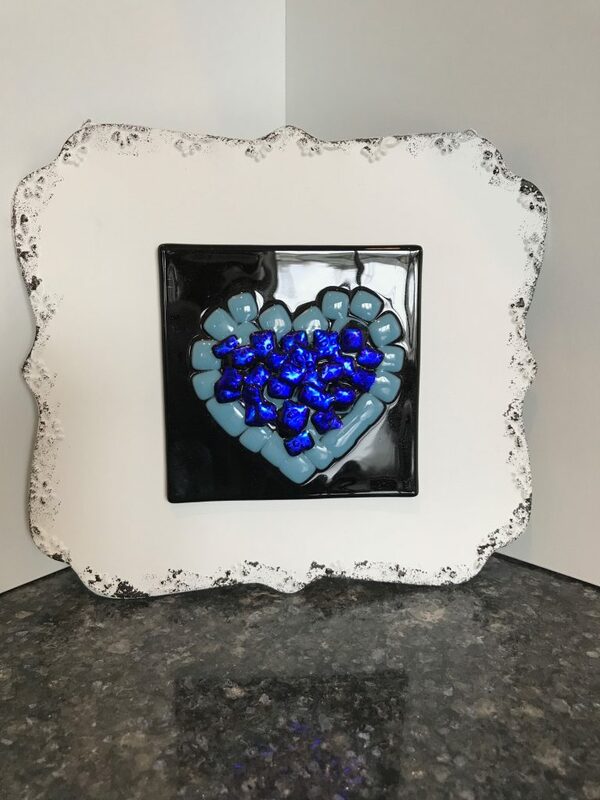 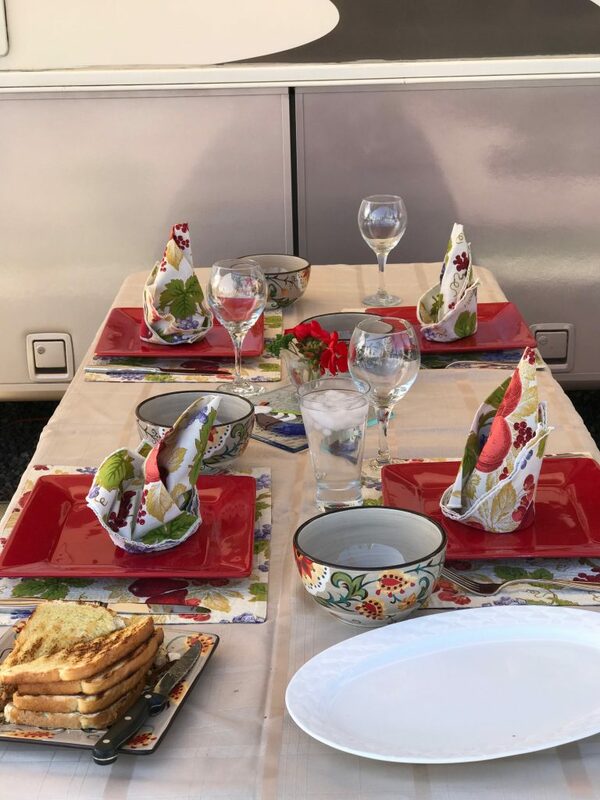 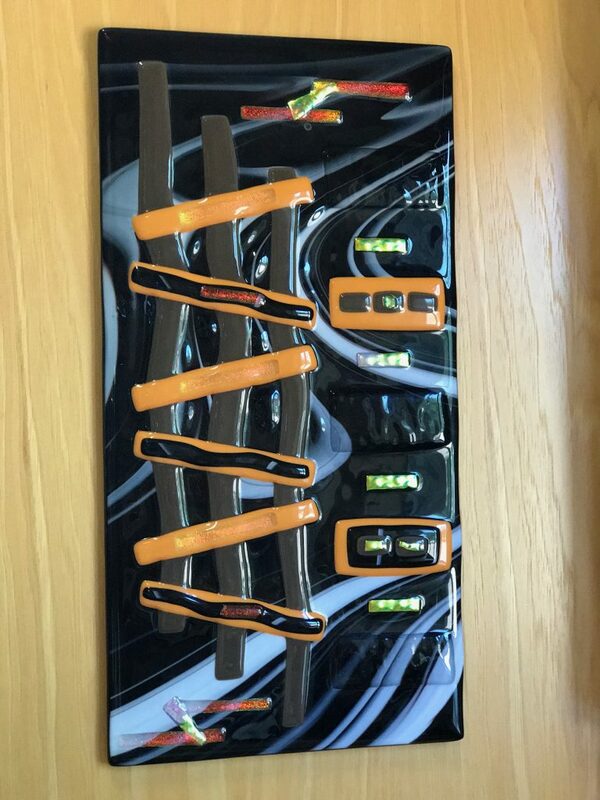 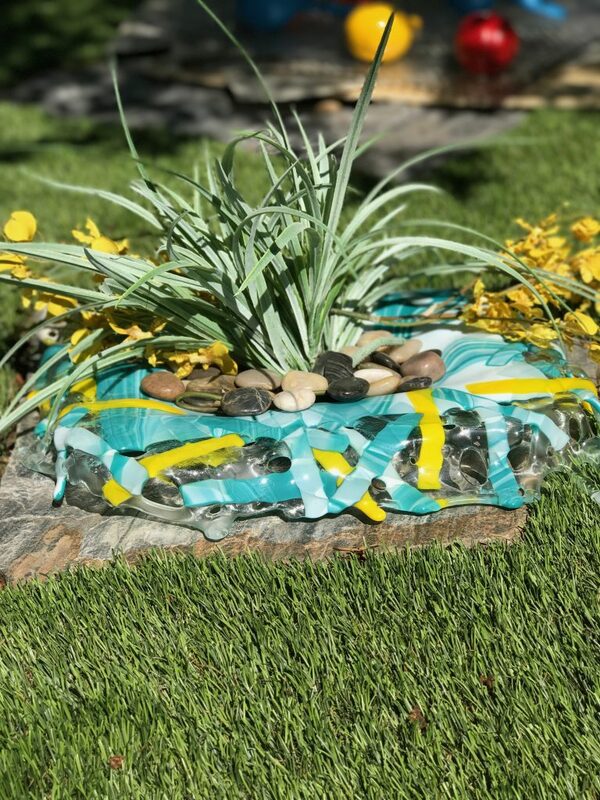 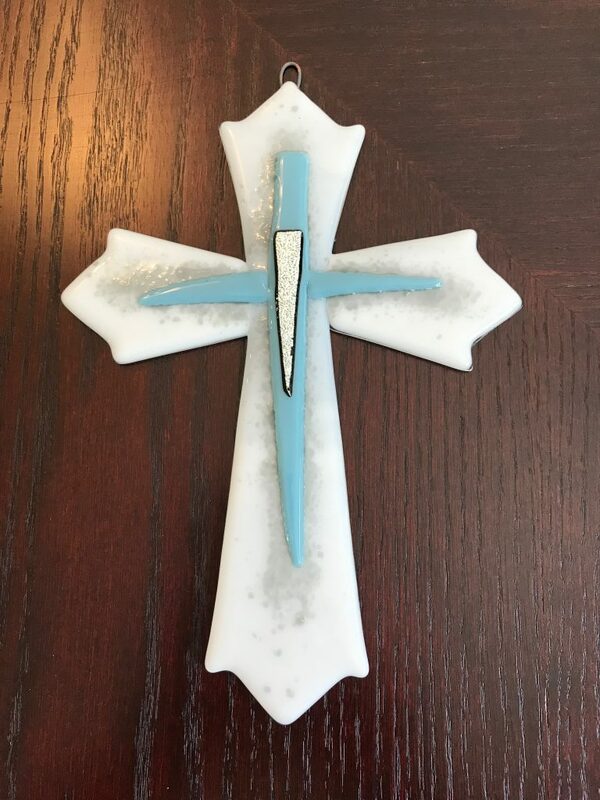 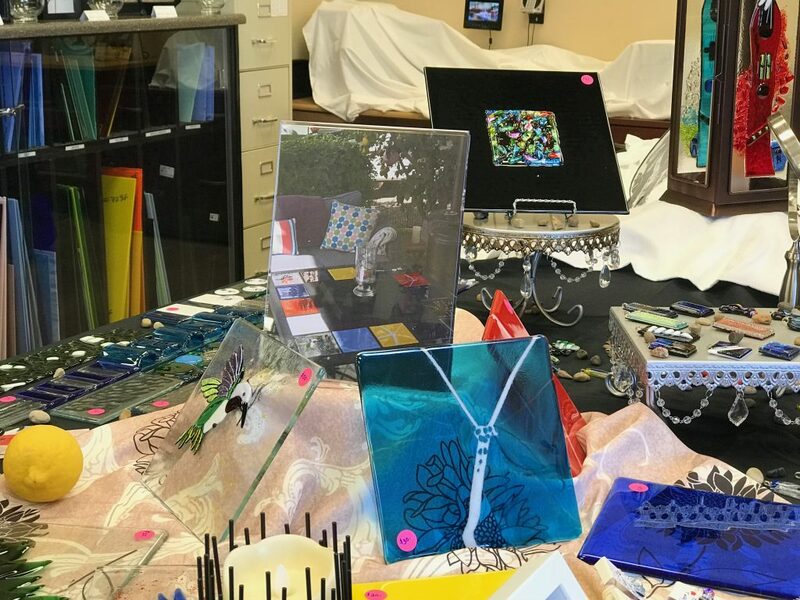 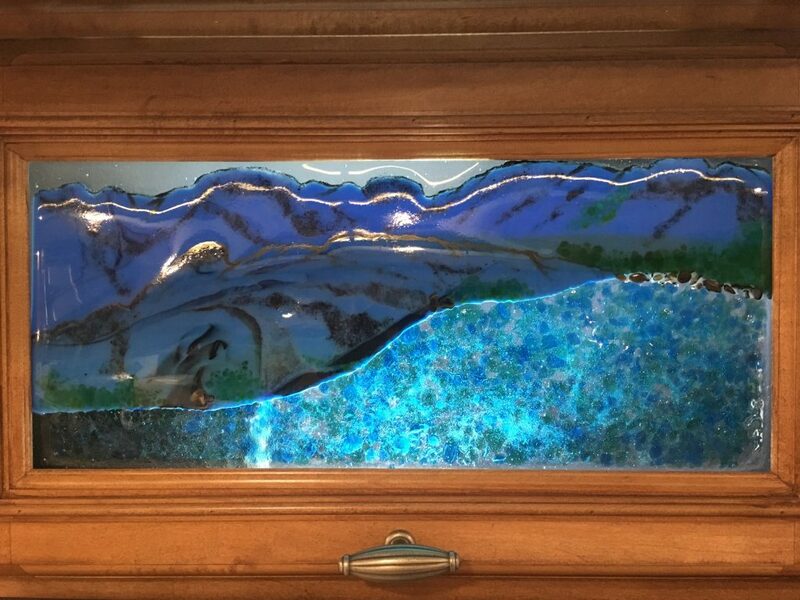 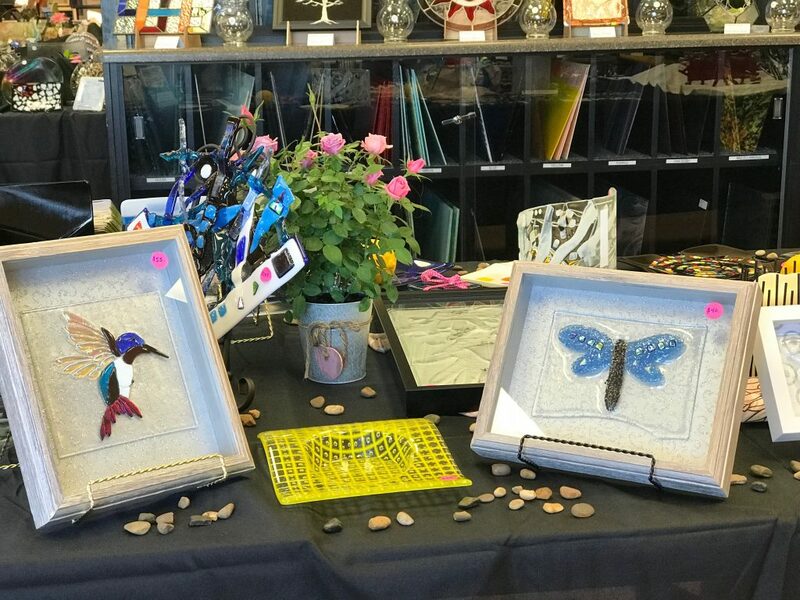 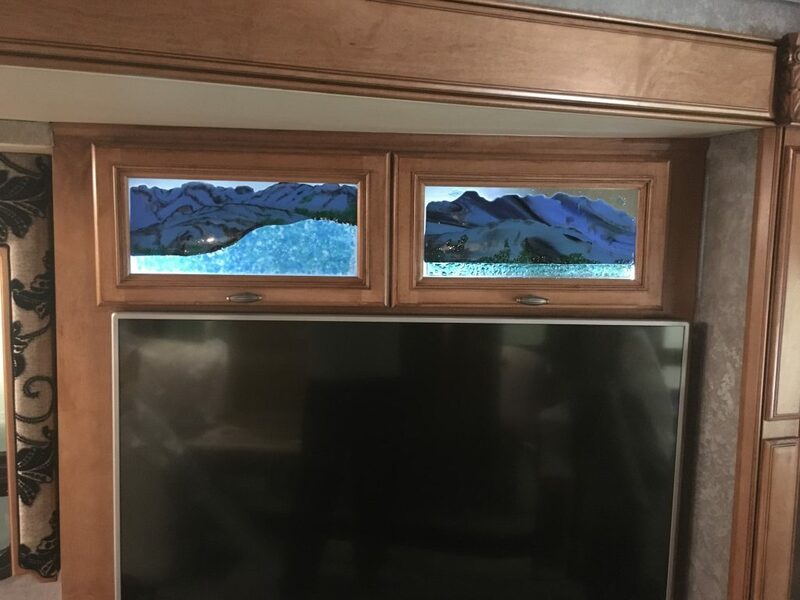 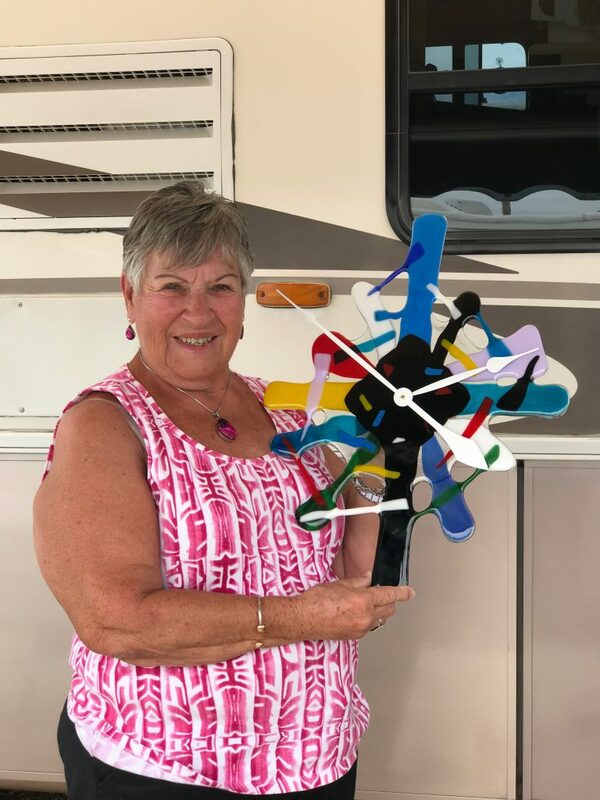 The original broke on me and I had to then redo it and have the glass cut so it would fit into the mold (Thank Goodness for the people at the RV Resort we are at – they love to help you and you learn so much from them always) . 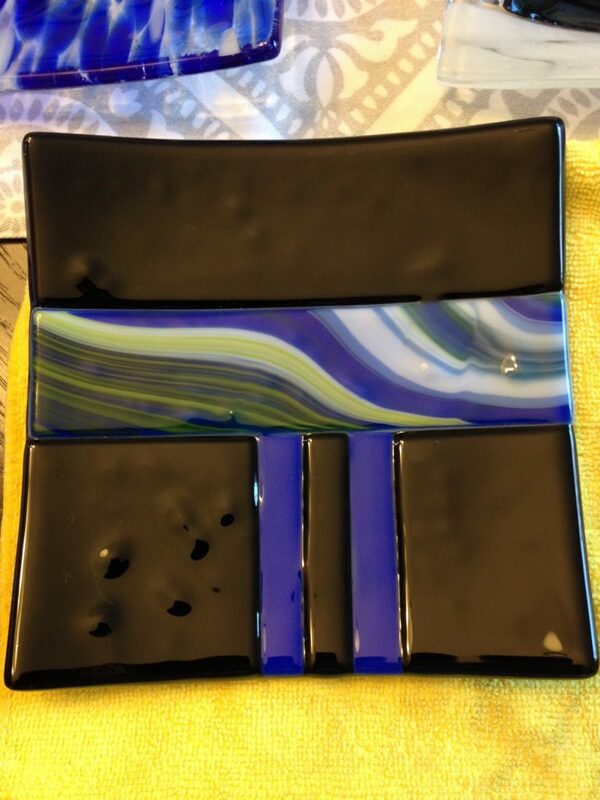 I have to say it turned out beautiful!!!! 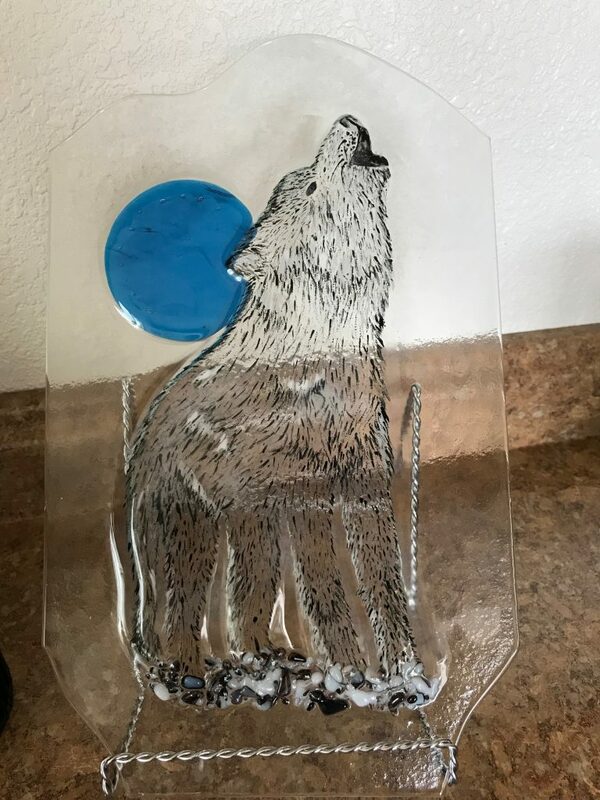 This is a piece I did for my daughter to give as a Thank You Gift. 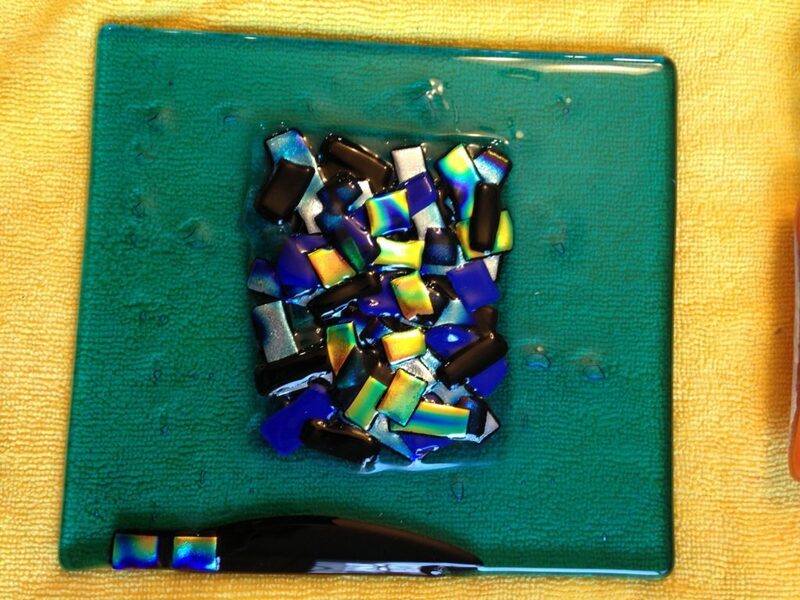 The Dichroic gives it a beautiful effect, especially when the light shines on it. 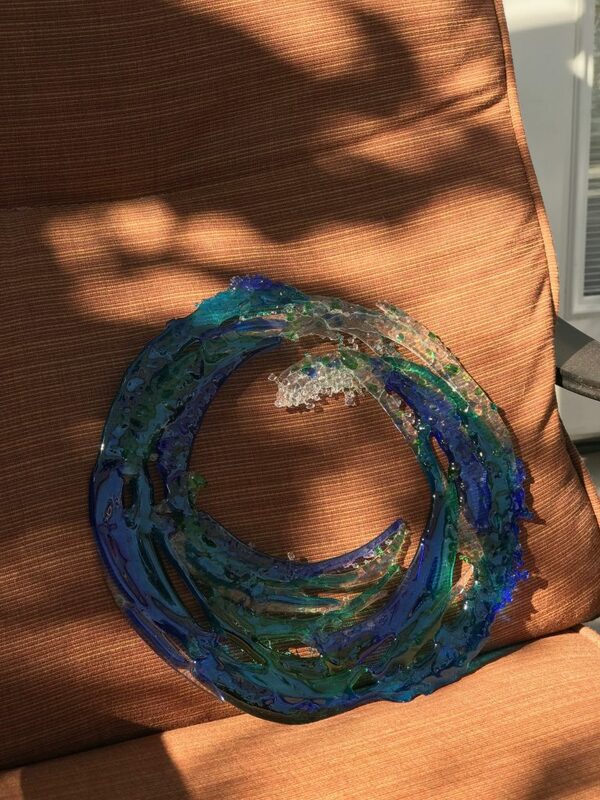 You can either Hang this or put it in a frame holder. 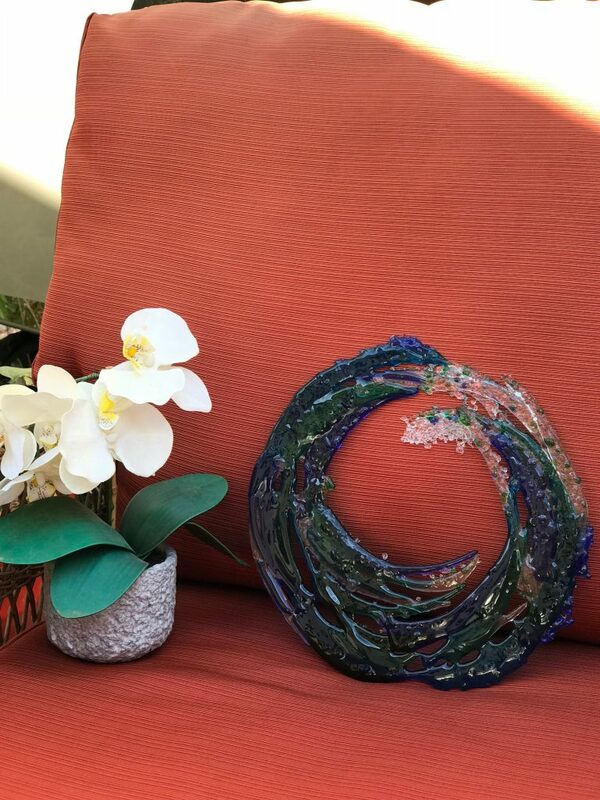 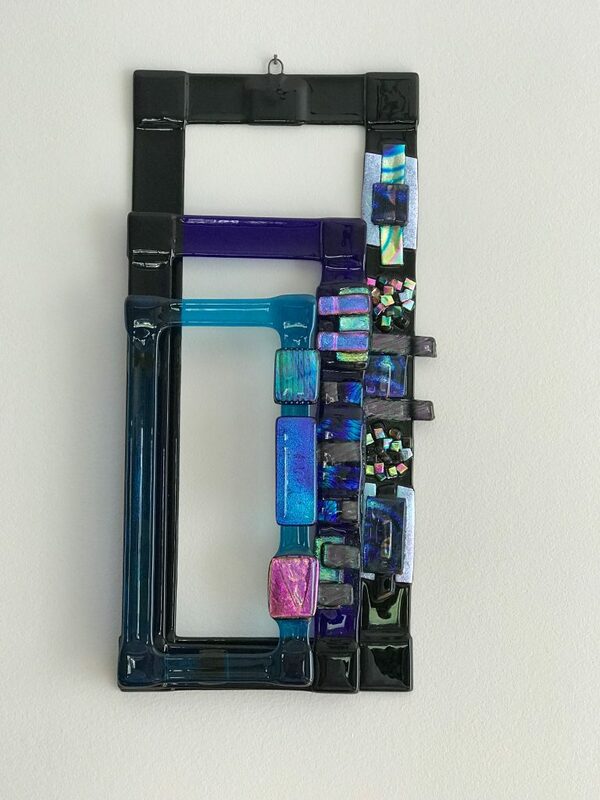 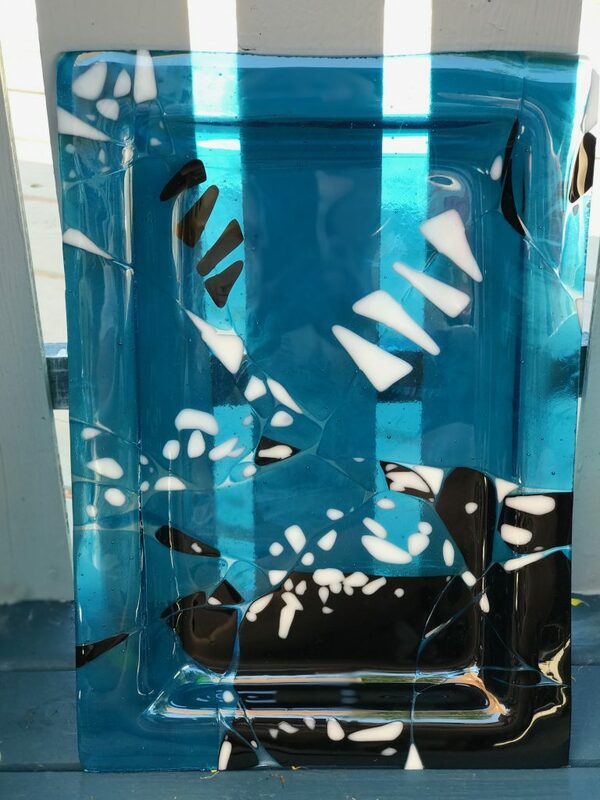 The Piece below I made when I started doing Fusion Glass at home, my daughter saw it and claimed it for herself. 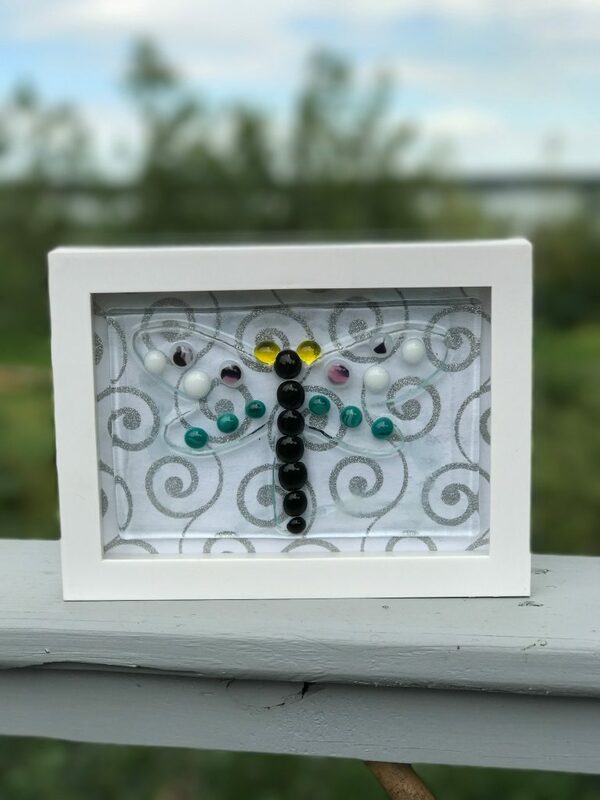 My Dragon Fly was I think one of the fastest projects I have ever done, I had space in my Kiln and just threw this together – add a few of the pebbles to give it colour – and thought lets see how it turns out. 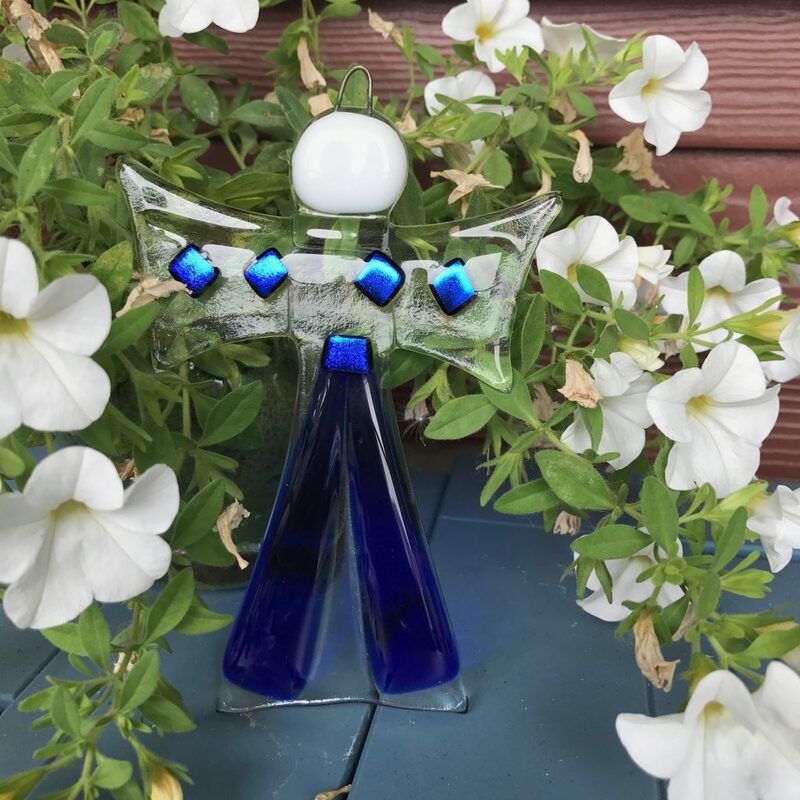 My Angels are one of my favourite projects – I actually made them for my family to hang in their windows as Christmas Decorations and I think they all still have them up, as do I. 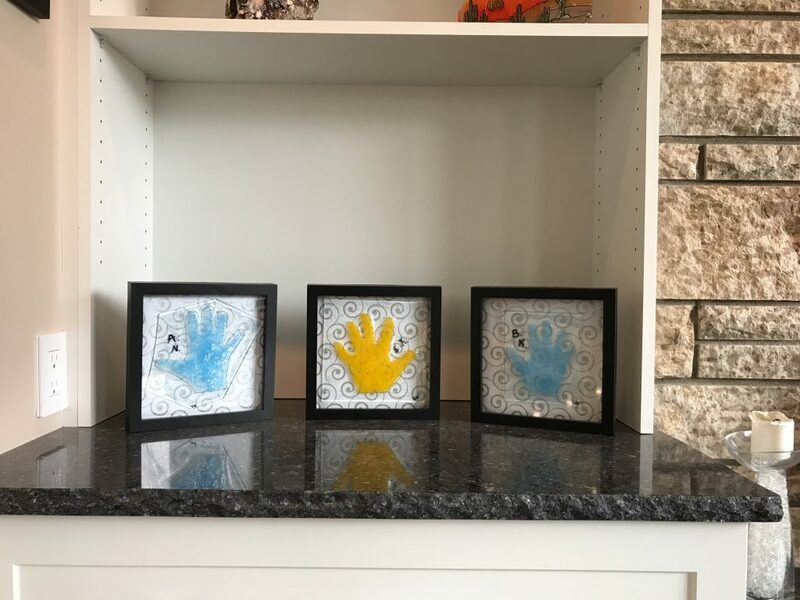 These are my Hearts, I actually made these for both of my Daughters and My Mom for Mothers Day!!! 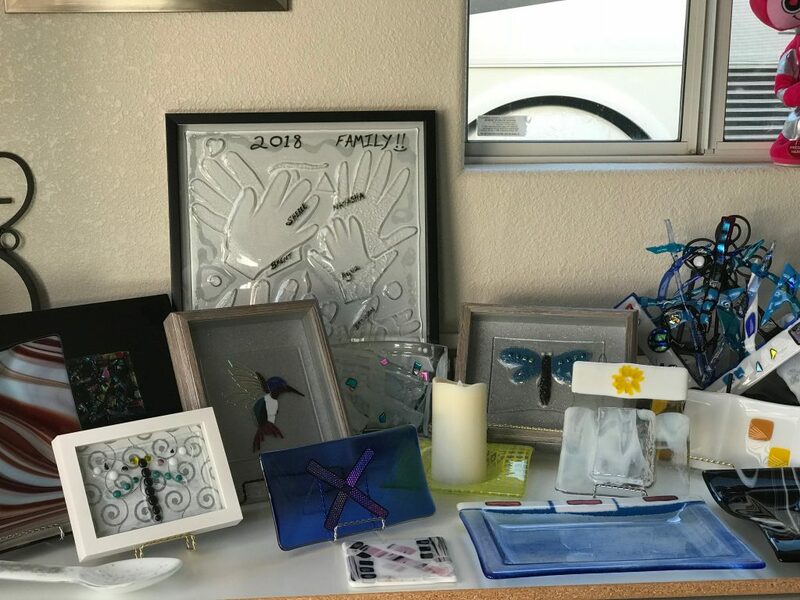 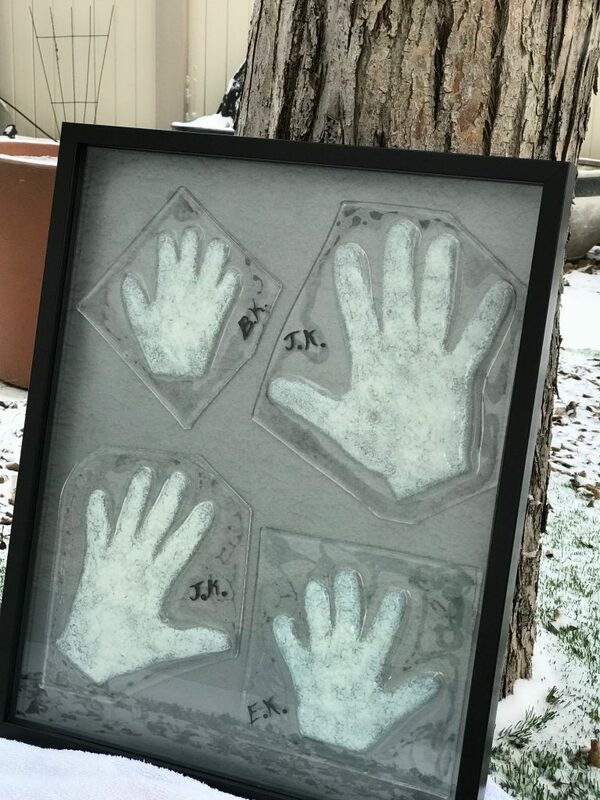 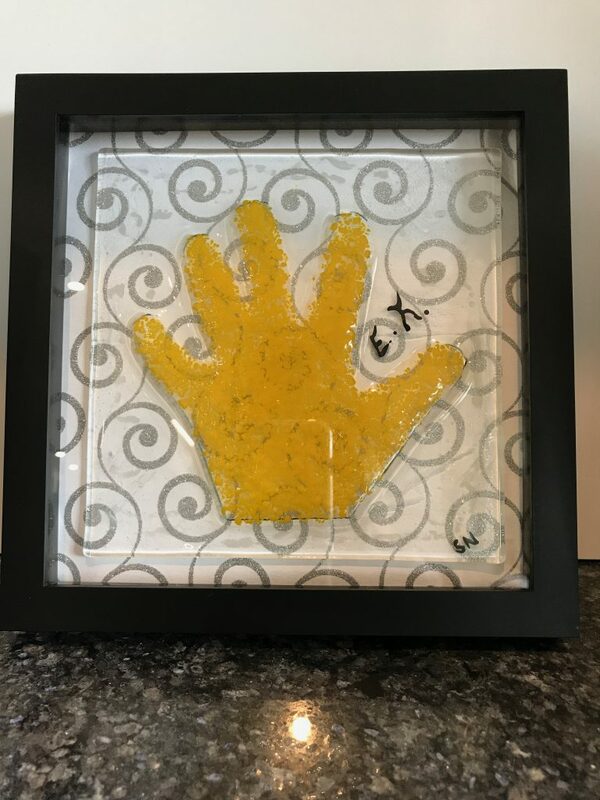 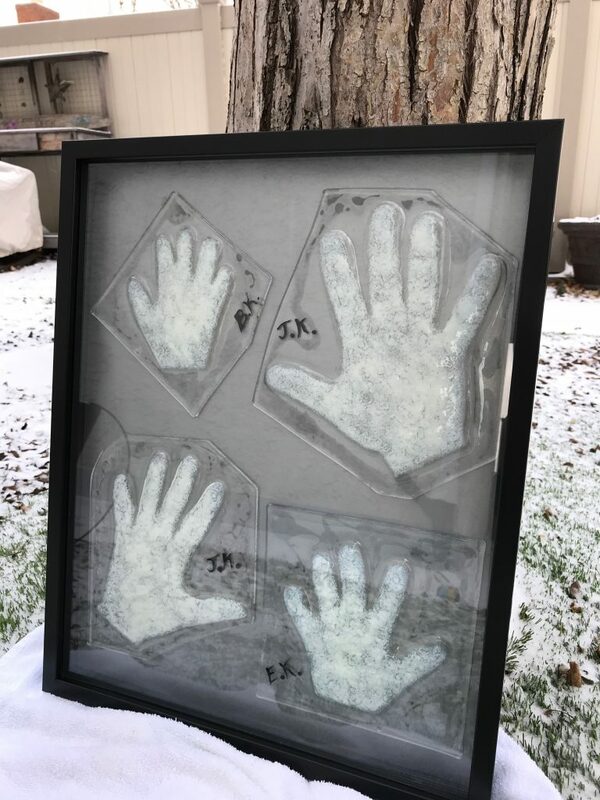 The hand prints below belong to all of my Grandchildren, It was mothers day coming up and I had them all over at my house the week before, so I thought this would make a great presents for their mothers. 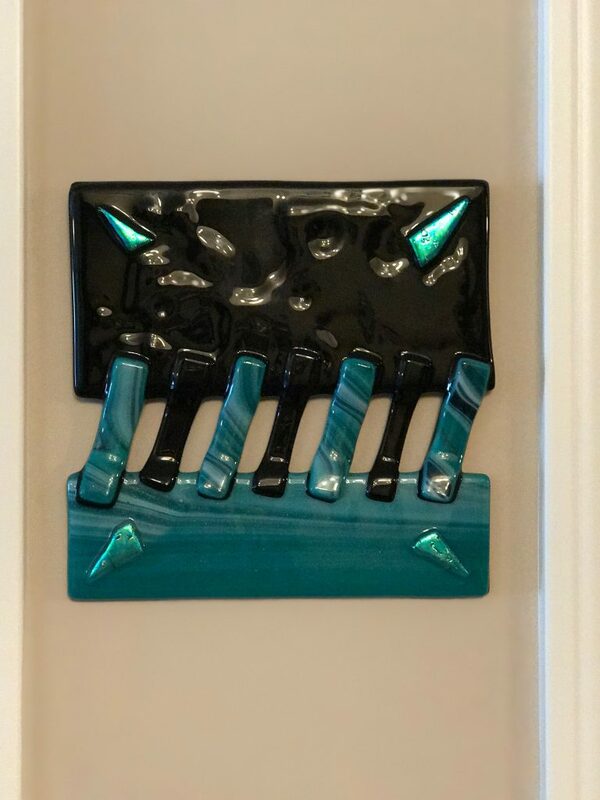 I have to say I really do love these pieces (naturally because they are my Grandchildren), but also because they took me into another part of the fusion world. 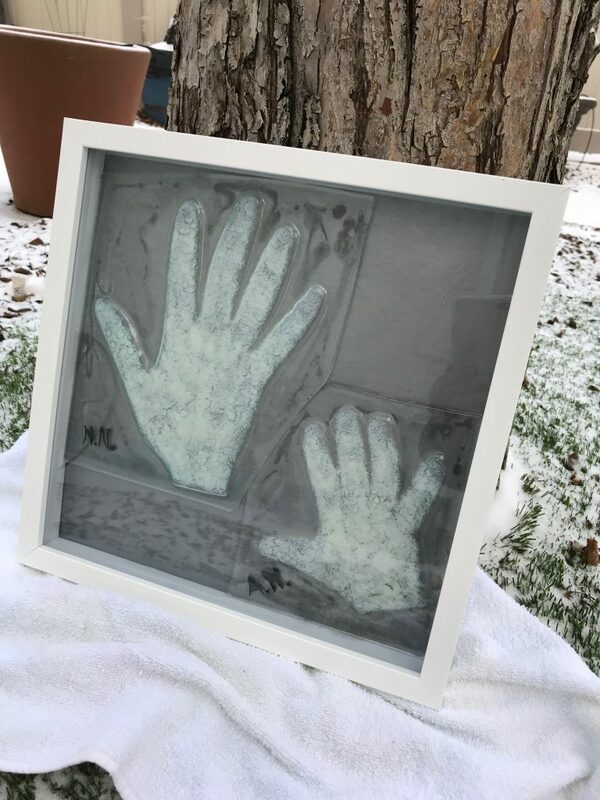 You also can have these Handprints made for yourself or loved ones and always have the memories of what they represent. 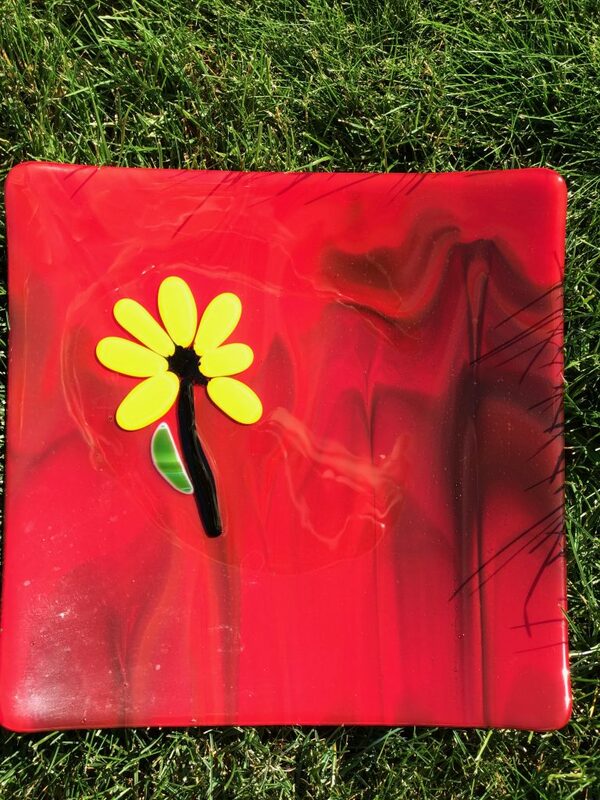 The Plate below I made for my Mom who loves Red, I thought I would add the Flower because I love flowers and thought it would make this an original piece just for my Mom. 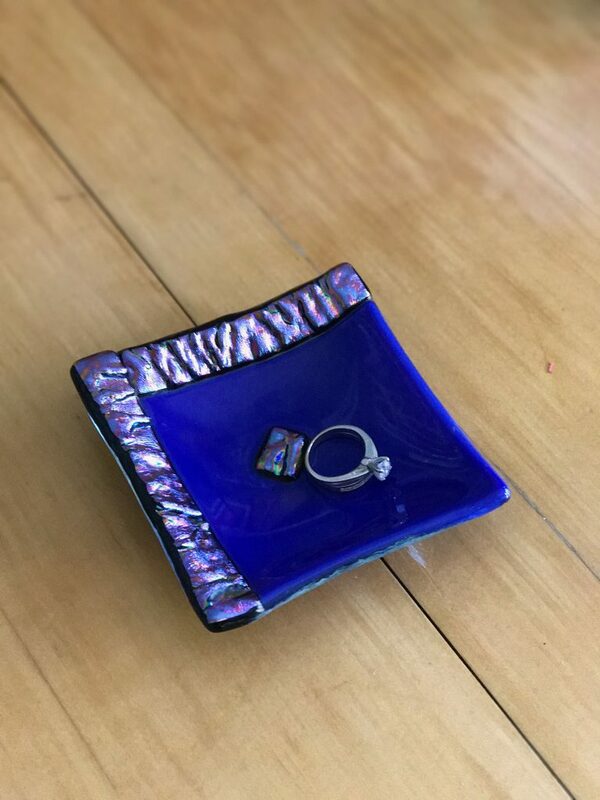 The Serving Plate below I made because I wanted to use up some scrap Glass that I had – I cut it all out and then stood there for about 45 minutes trying to figure out how I was going to lay it out. 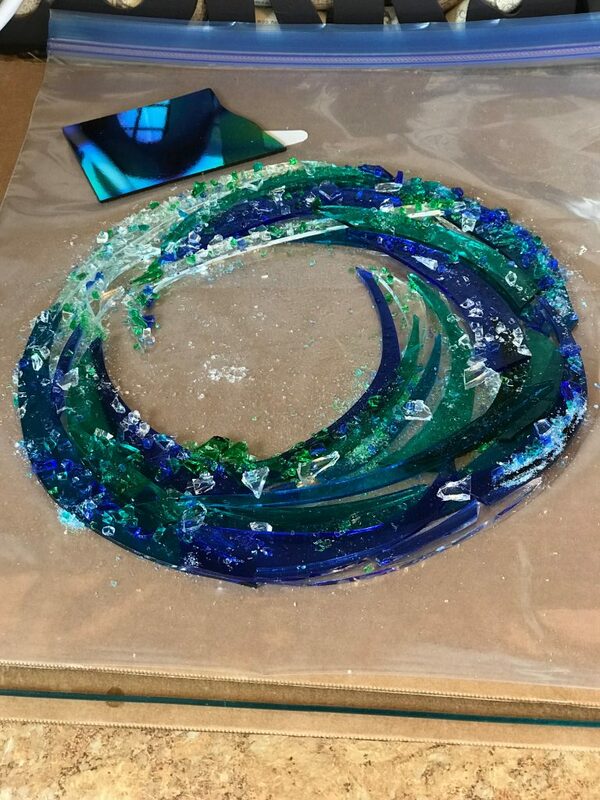 Considering I really had no plan it actually turned out quite beautiful. 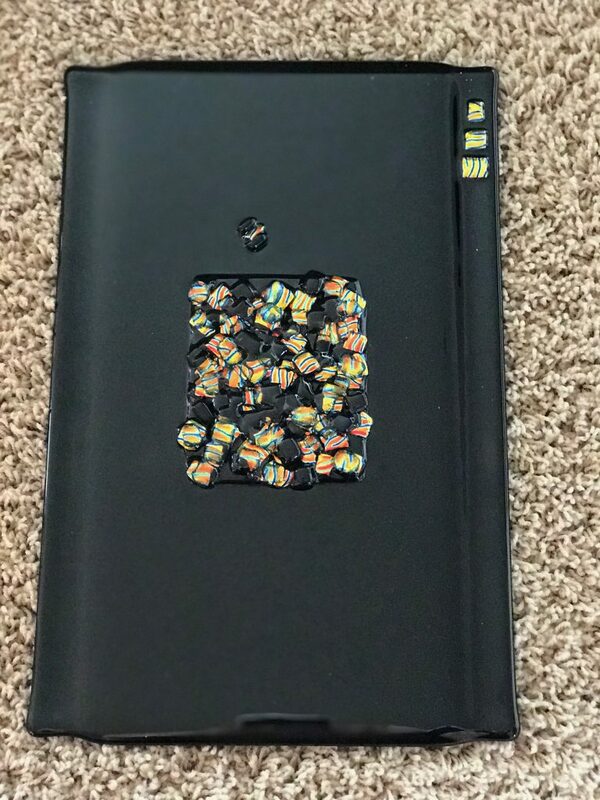 My Oldest Daughter now has it. 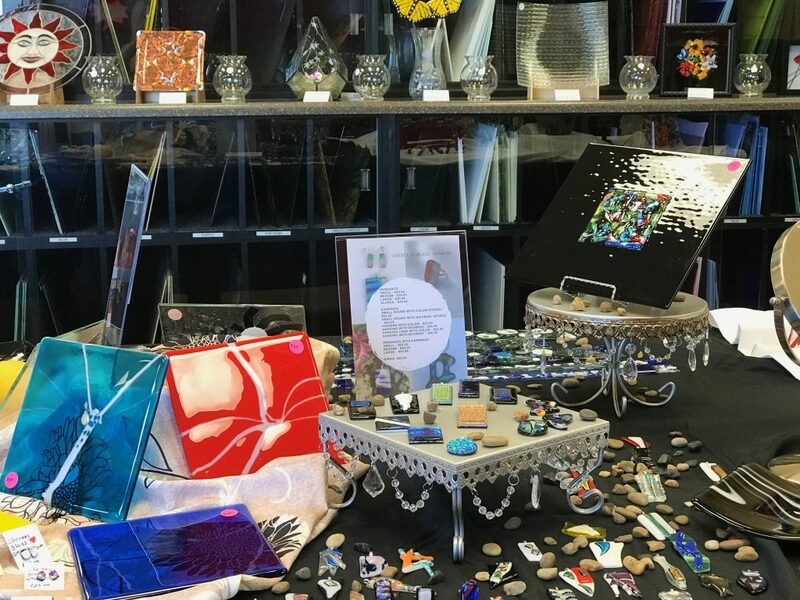 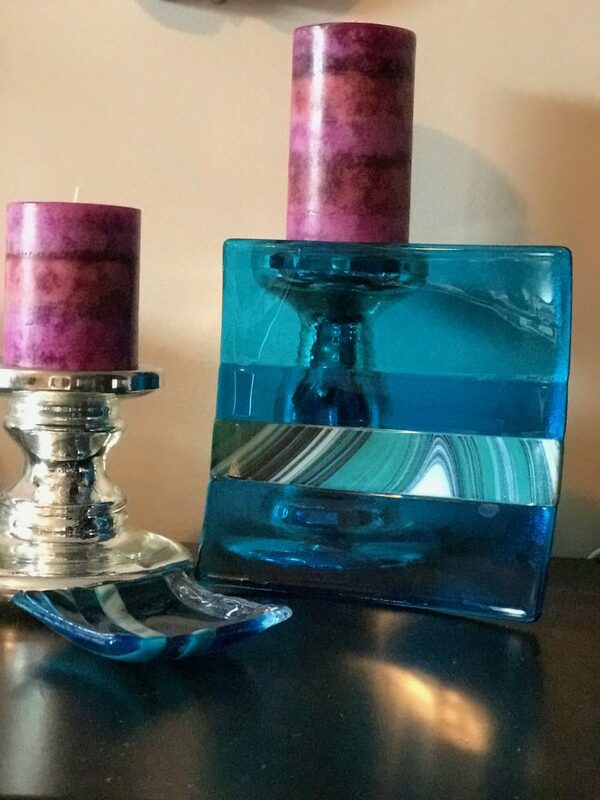 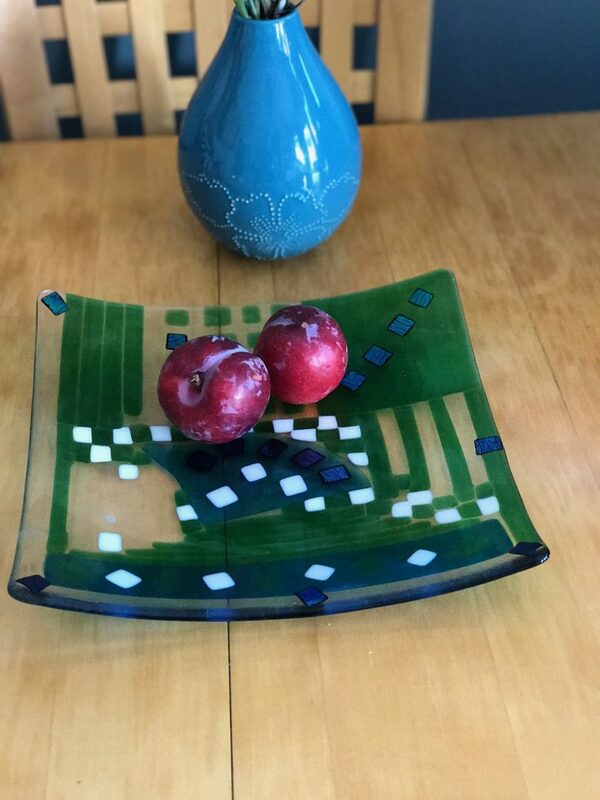 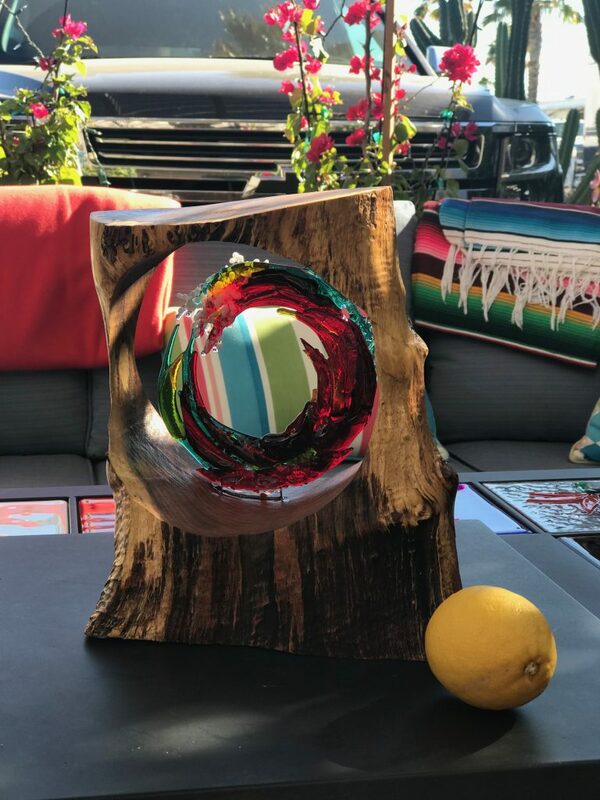 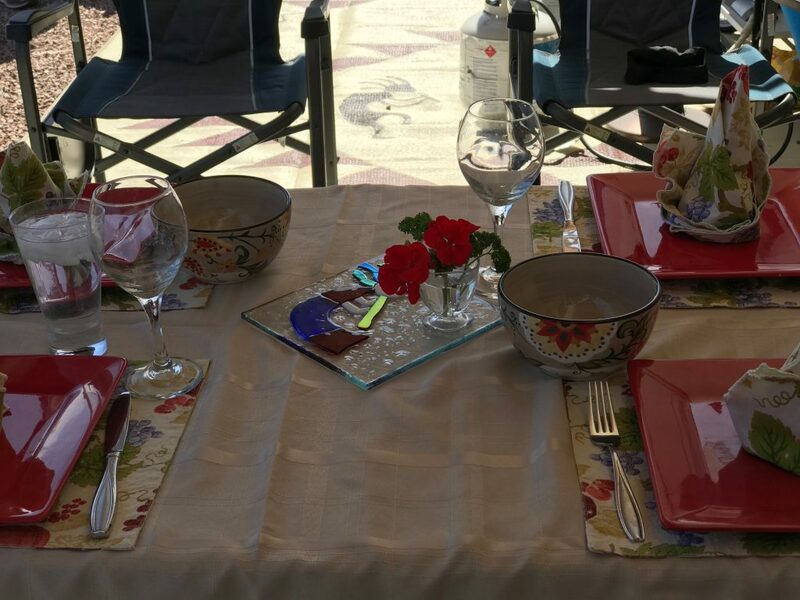 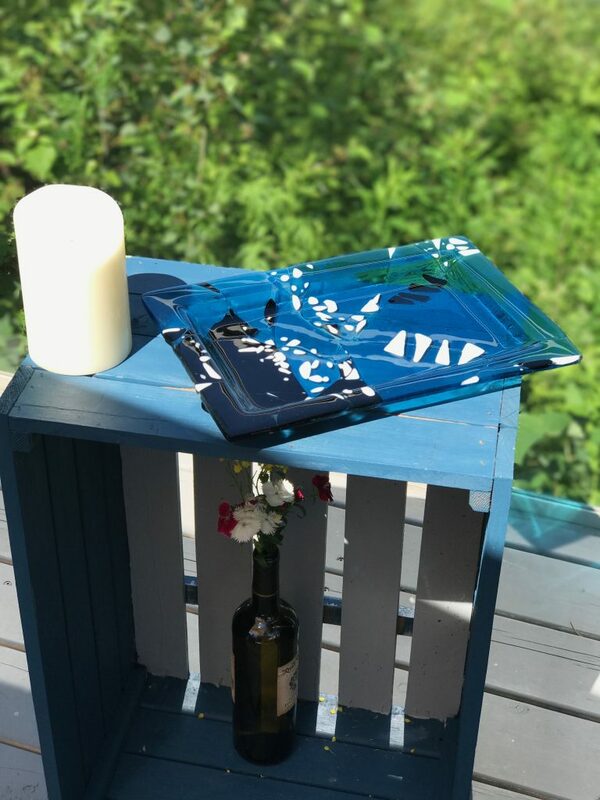 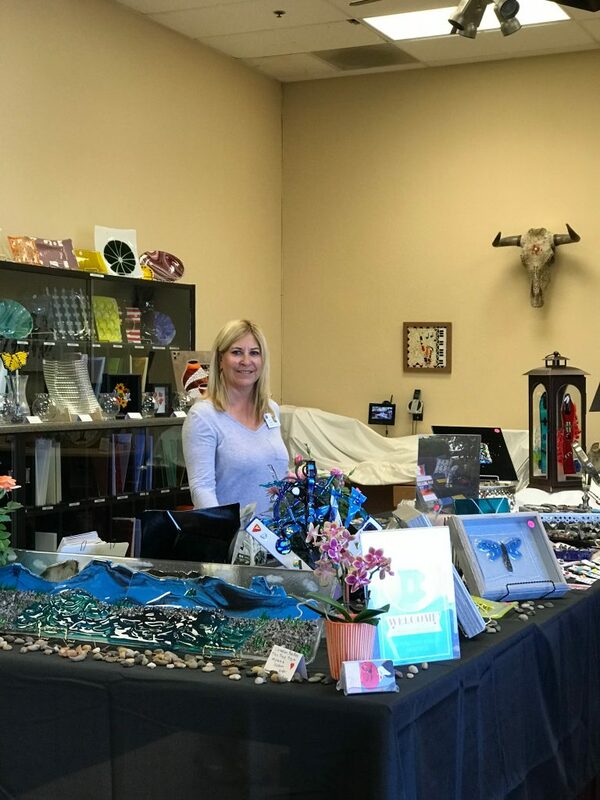 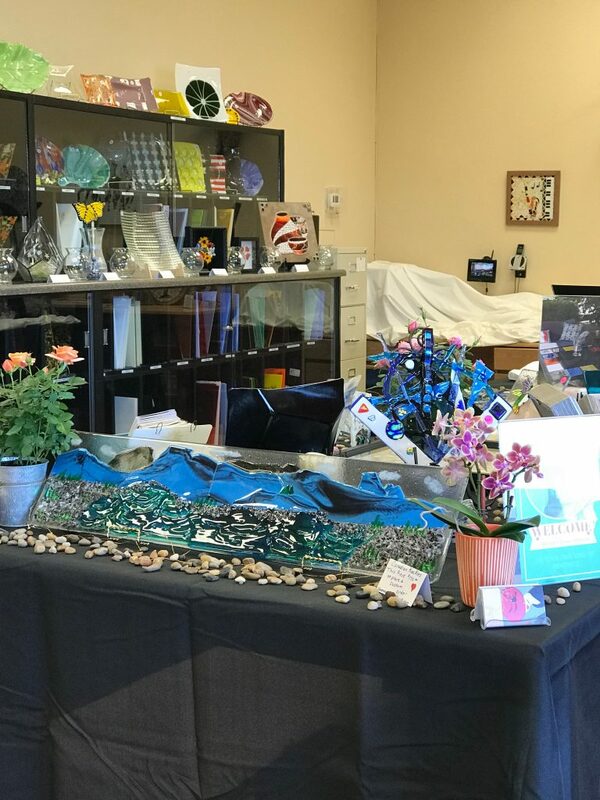 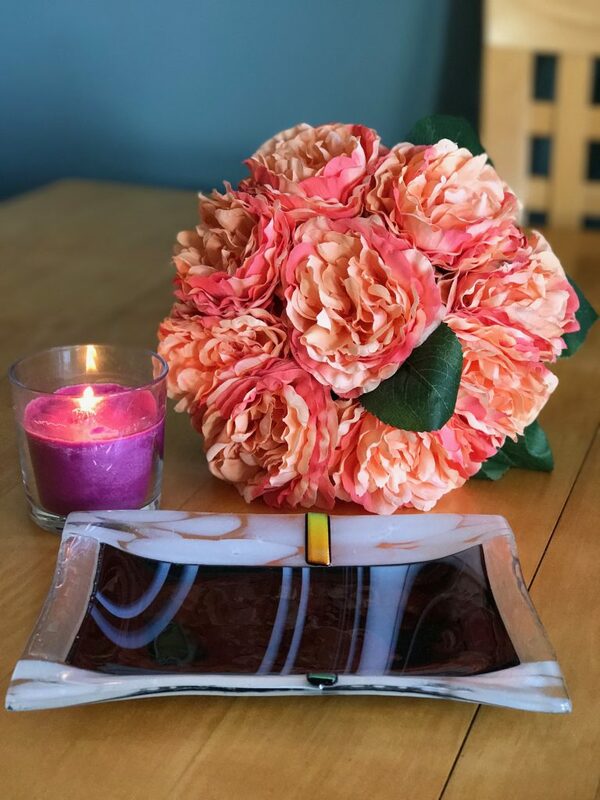 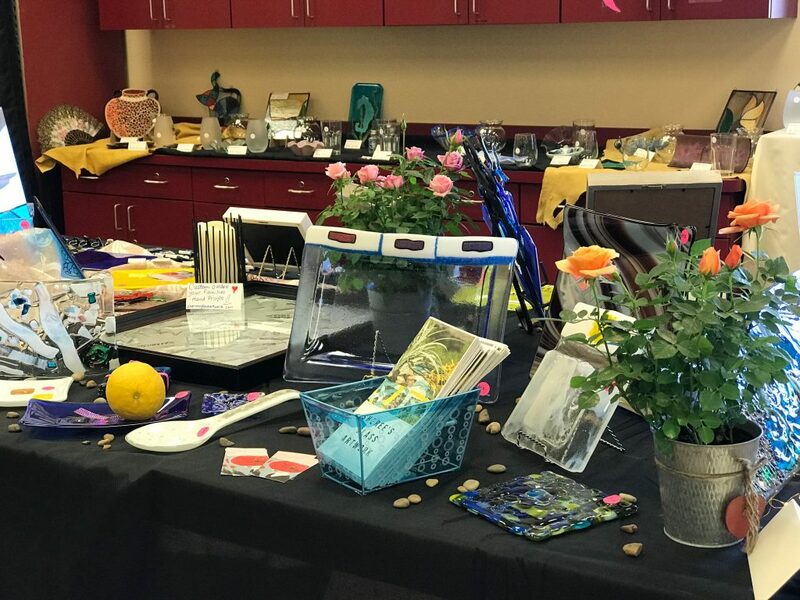 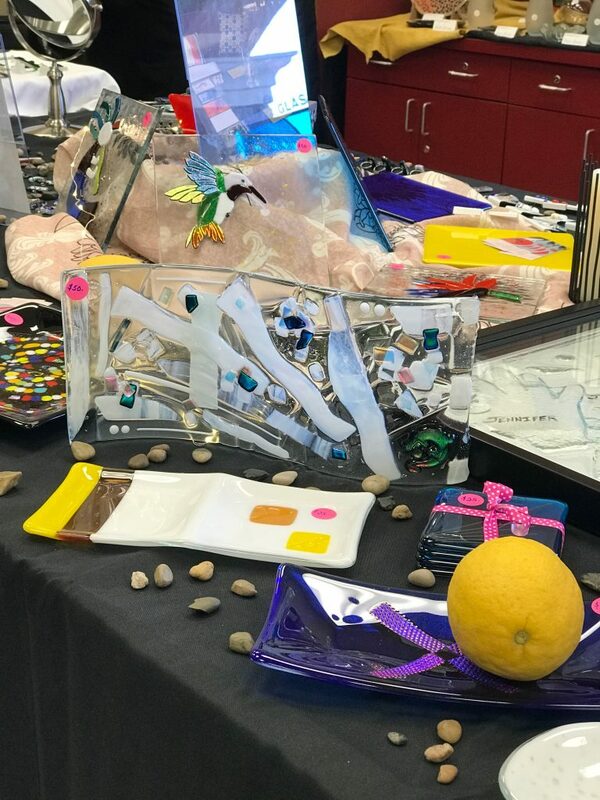 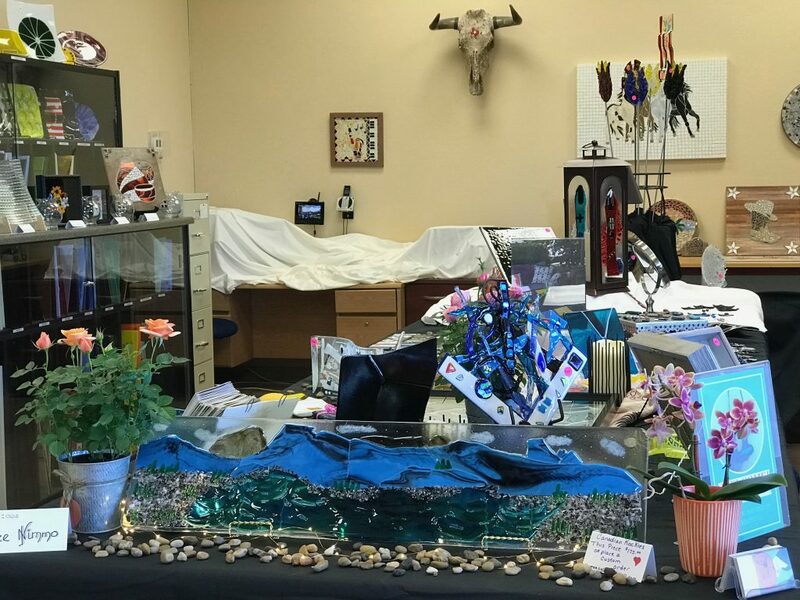 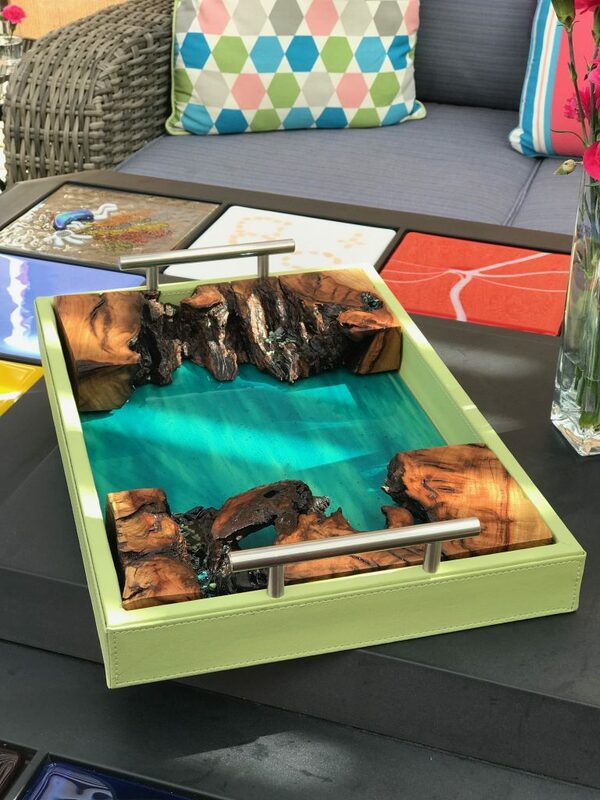 This wonderful lady that purchased my Kokopelli wanted to show me how she used it as a centre piece for her table, so I took a picture of the table as it looked so pretty and wanted to share with you another way Fusion Glass can be used.